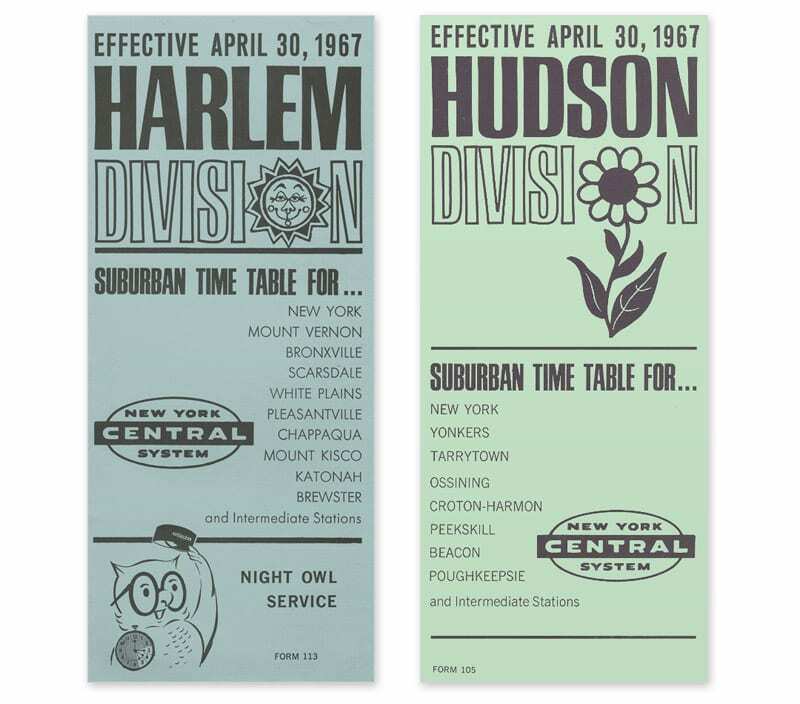 Not everything you’ll find in my collection is printed on paper… Admittedly, I have a little thing for roll banners (I own three for the Harlem Division). 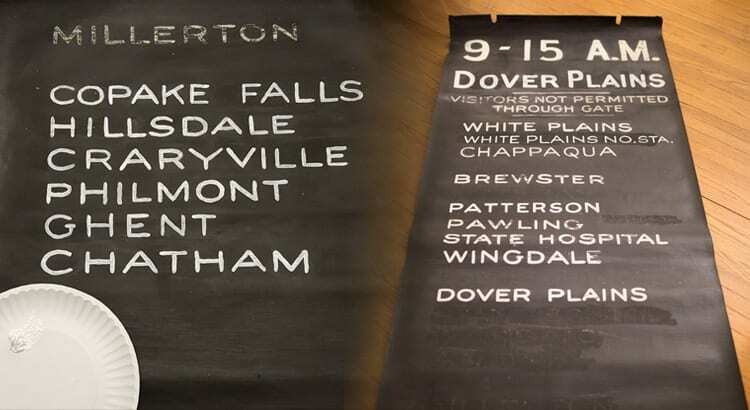 Long before computers and other technology, these roll banners used to be displayed in Grand Central Terminal at each gate, letting passengers know what stops the train made. 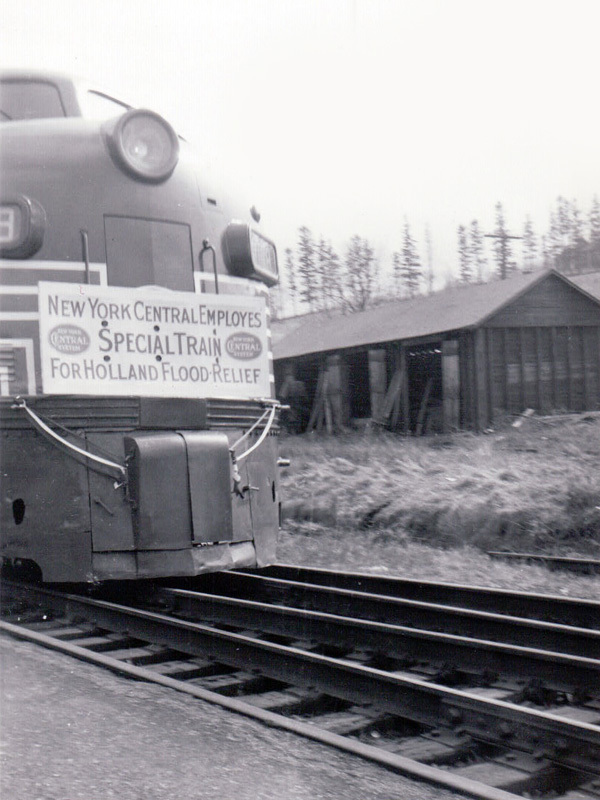 Each train had it’s own roll sign, which were stored in cabinets by the gate. The roll banner featured in this post was my third banner acquisition – but it was one I couldn’t resist, as it was originally an Upper Harlem Division banner. 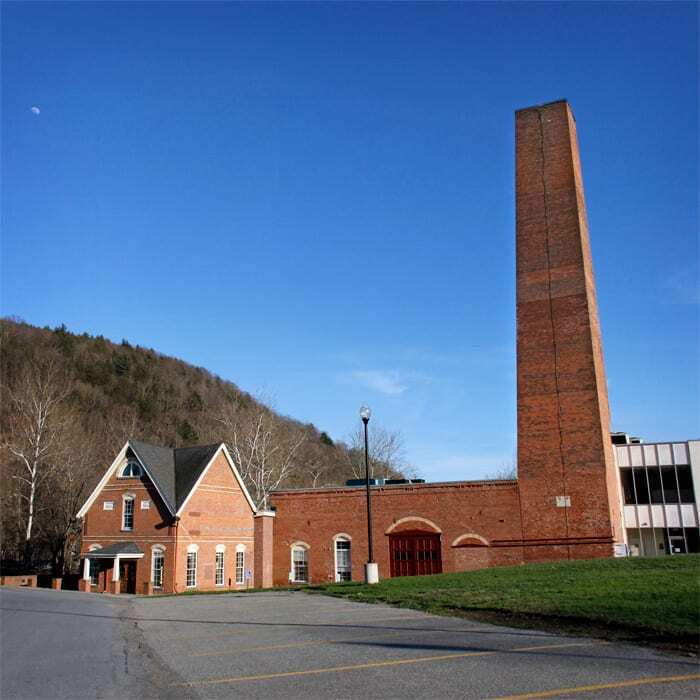 Sold by the SONO Switch Tower Museum on eBay as a fundraiser, their original photo of it is at right. 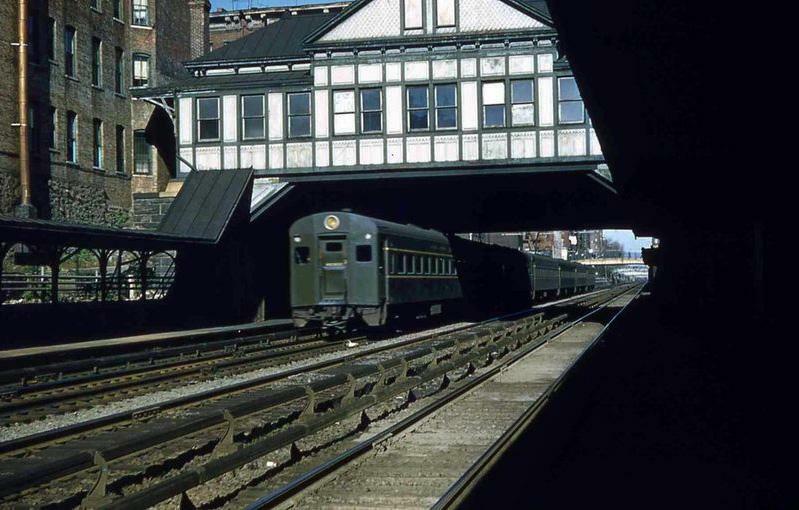 As you can see, after the 1972 discontinuation of the Upper Harlem Line, those stops listed were blacked out. 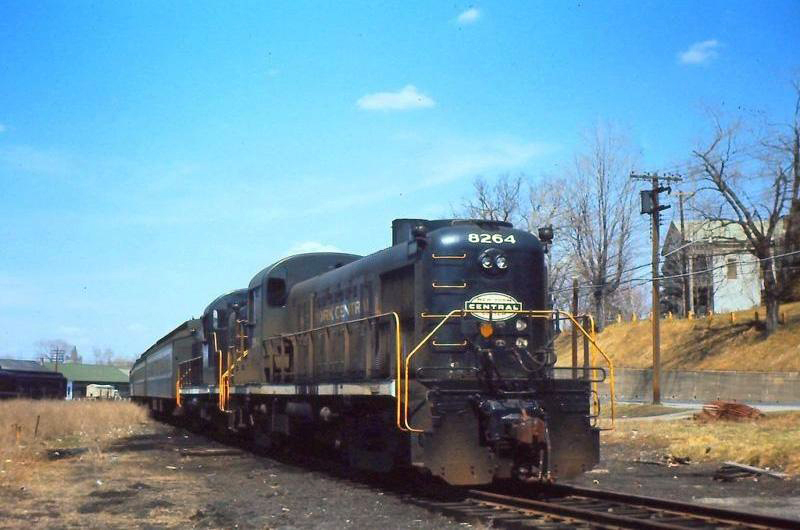 All of the banners were actually hand-painted by a real person, and when train names were changed, the signs were modified to fit – in the case of the black paint, some more drastically than others. 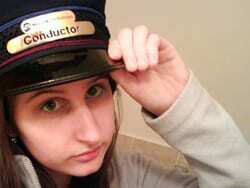 With the aid of old timetables, I was able to track the history of the banner, and the trains it once represented. 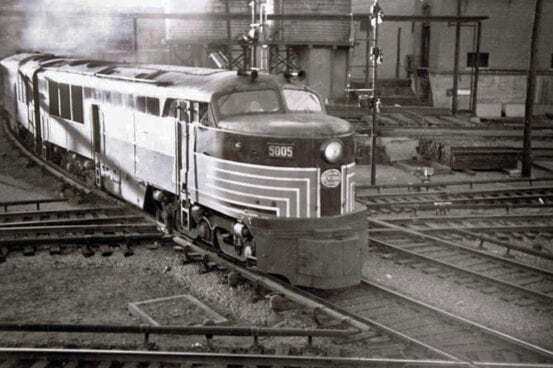 Though the train number changed a few times, for the majority of it’s life, the it was for a Sunday-only morning train from New York to Chatham. 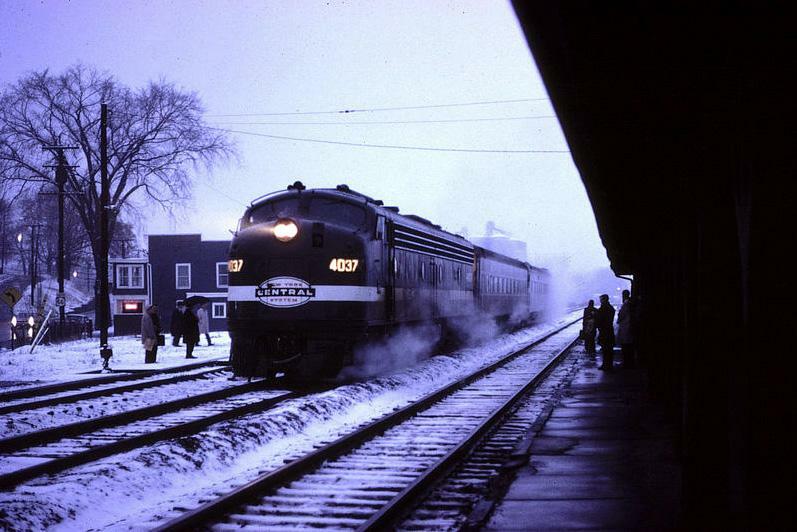 Unknown – 1958: Train 1053, which made a stop at Boston Corners. 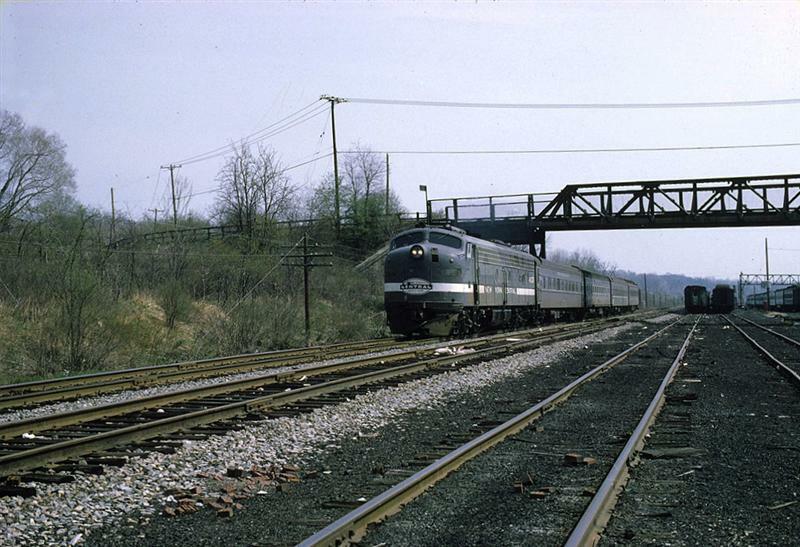 1958 – June 30, 1964: Train 905. 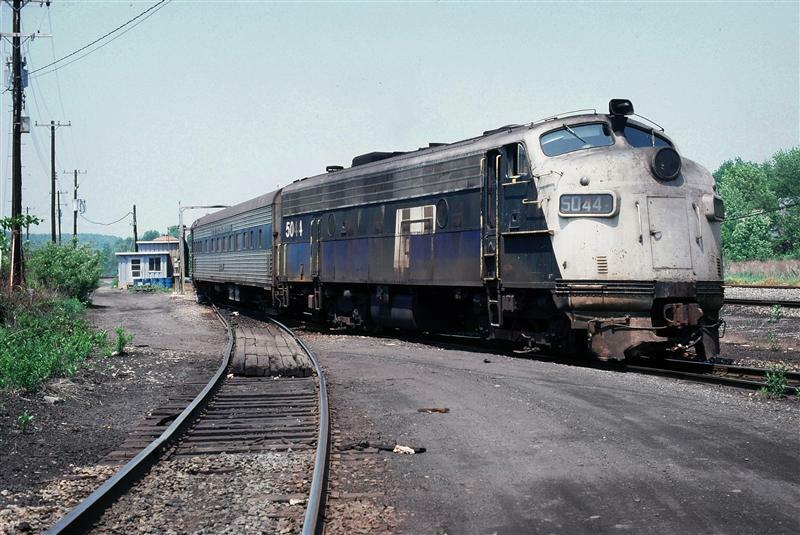 Ghent was blacked out in 1959 when it was removed as a stop. 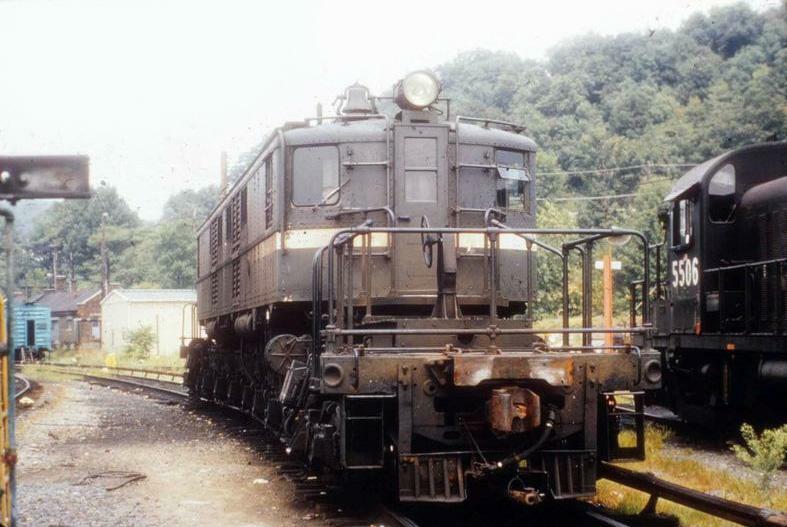 July 1, 1964 – November 30, 1968: Train 909. 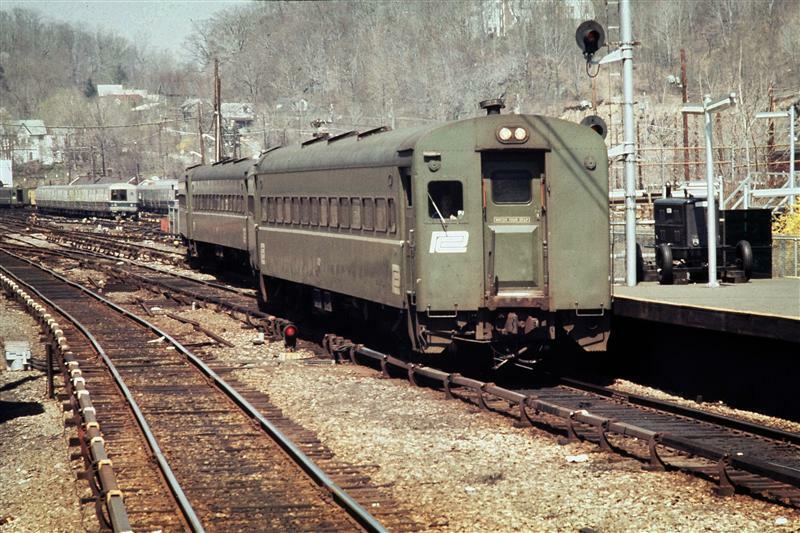 December 1, 1968 – March 19, 1972: Train 9009. 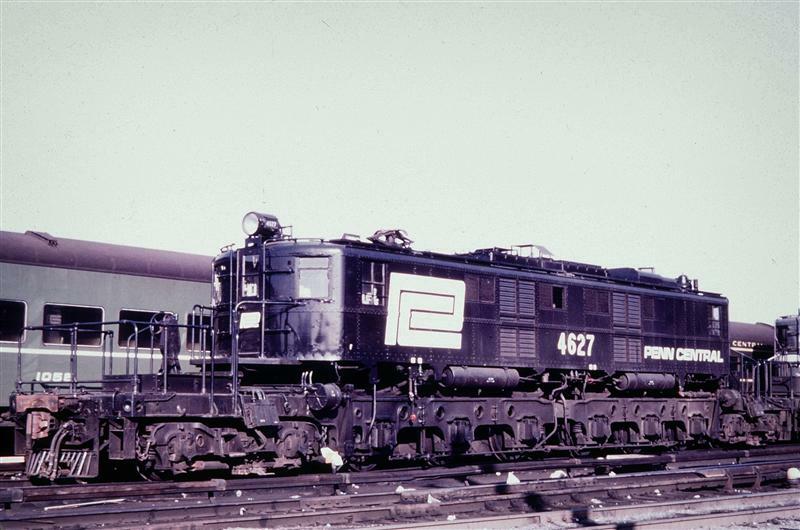 Number was changed after the Penn Central merger. 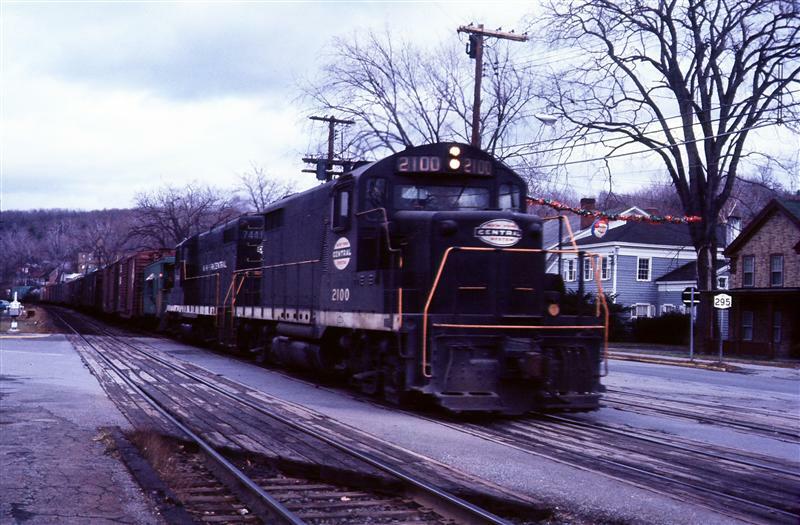 March 20th, 1972 – unknown: Eliminated stations were covered in black paint, and used for Train 9013, a Saturday and Sunday train. 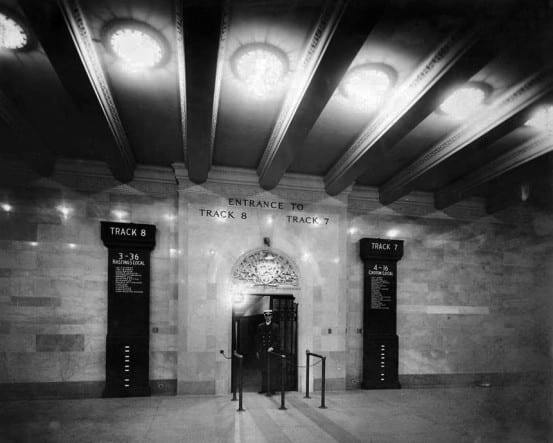 Early photo of Grand Central’s lower level, showing two departure banners, and the cabinets the banners were stored in when not being used. 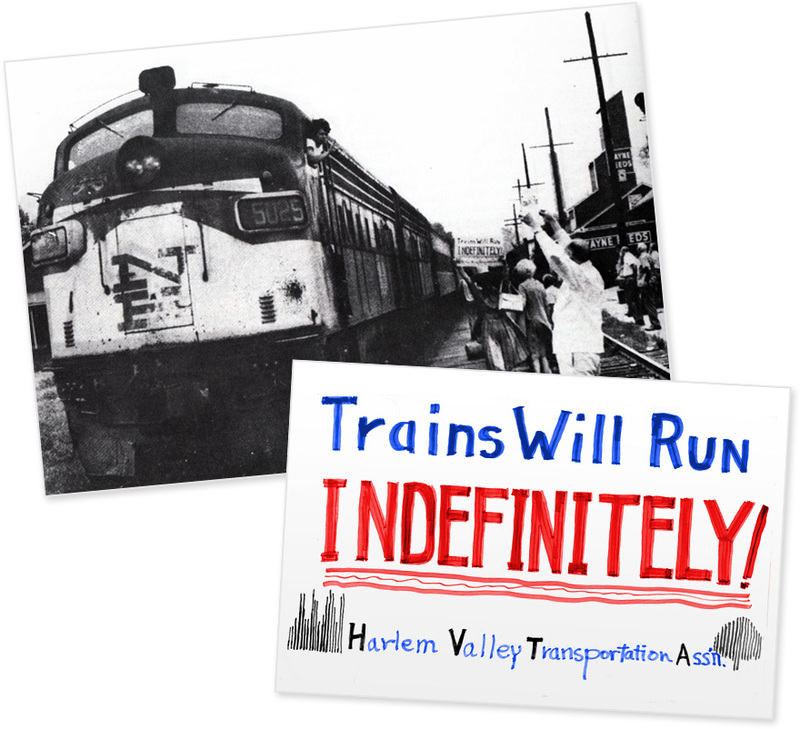 Today’s collection of historical Harlem Division photos features the Upper Harlem… including several crashes that occurred on the line. 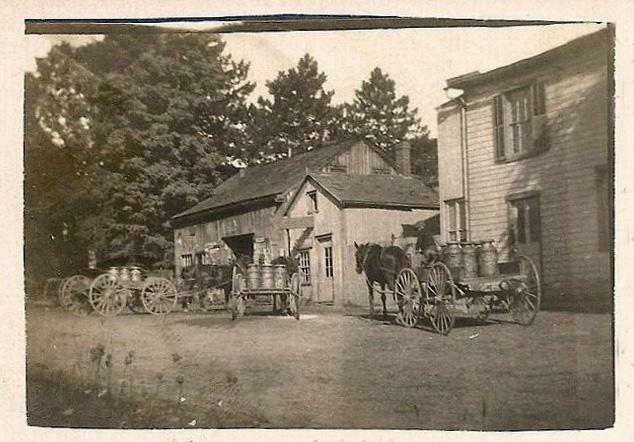 A huge thanks goes to Ron Vincent, who shared these photos from his family’s collection. 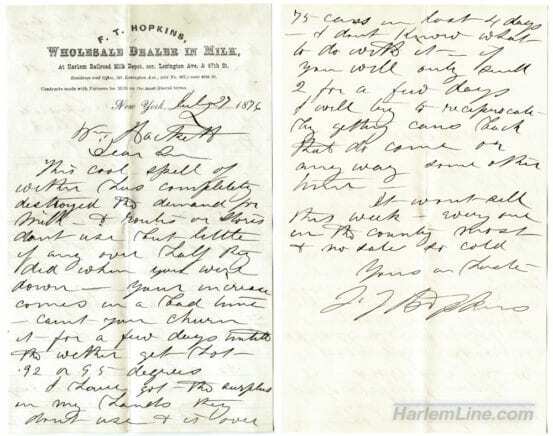 Ron’s grandfather worked as an RPO clerk on the Harlem for 36 years. 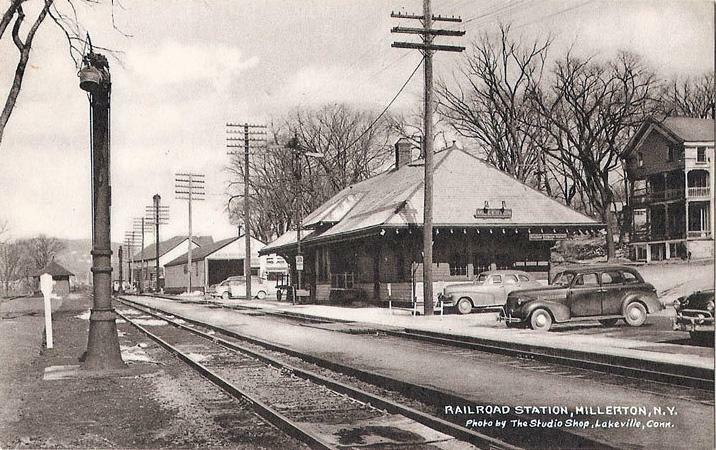 Many of the photos feature the long gone station of Hillsdale, where Ron grew up. 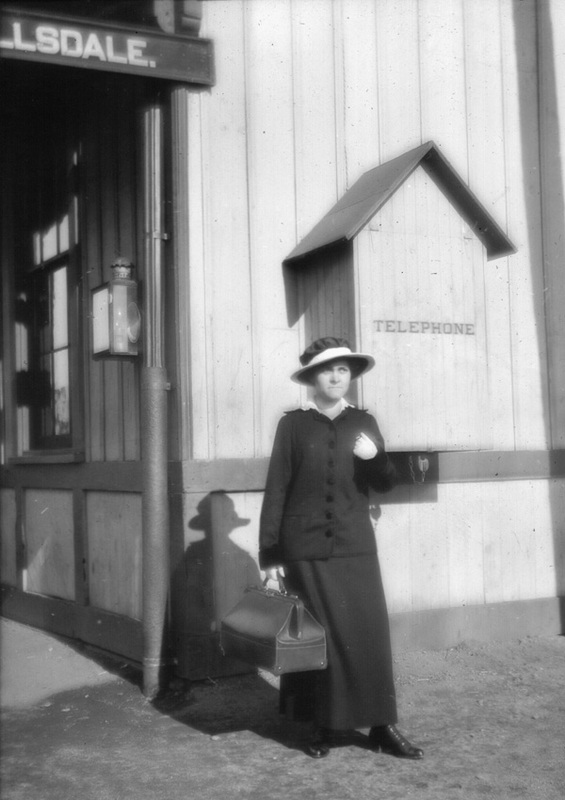 The photos capture an intriguing “slice of life” on the Harlem Division – we see Hillsdale’s station agent, Elliott Hunter, and his wife Marion. 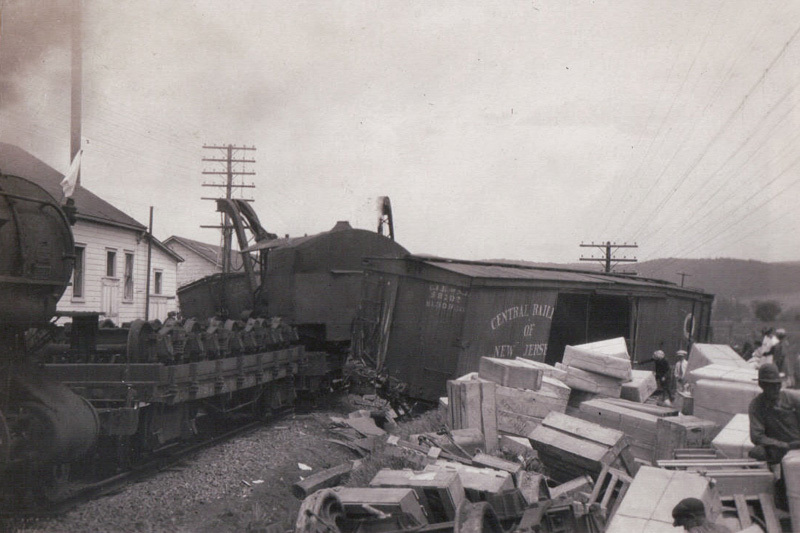 We see the occasional crash and derailment that brought gawkers from all around. 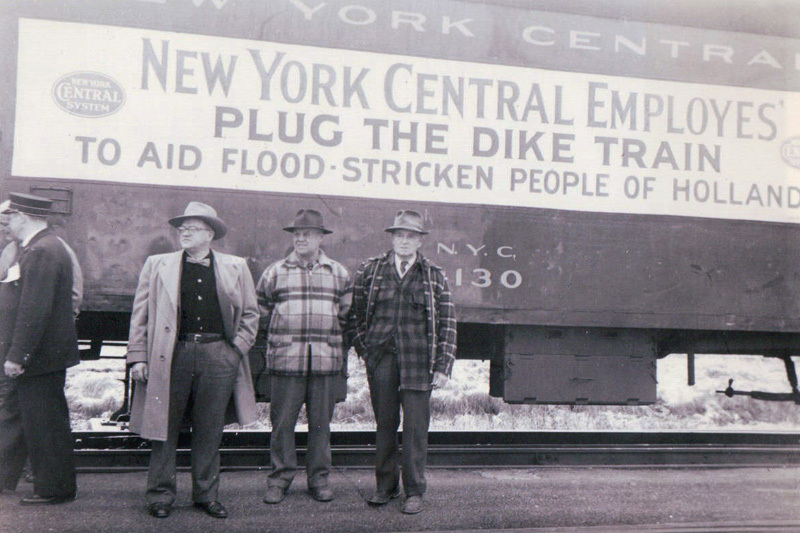 And we see the softer side of the Harlem, as it hosted the “Plug the Dike Train,” collecting donations for victims of the 1953 North Sea flood. In all, this is a great little set of photos… thanks again for sharing these with us, Ron! It is starting to be that time of the season where everyone is thinking about summer, and about taking vacations. 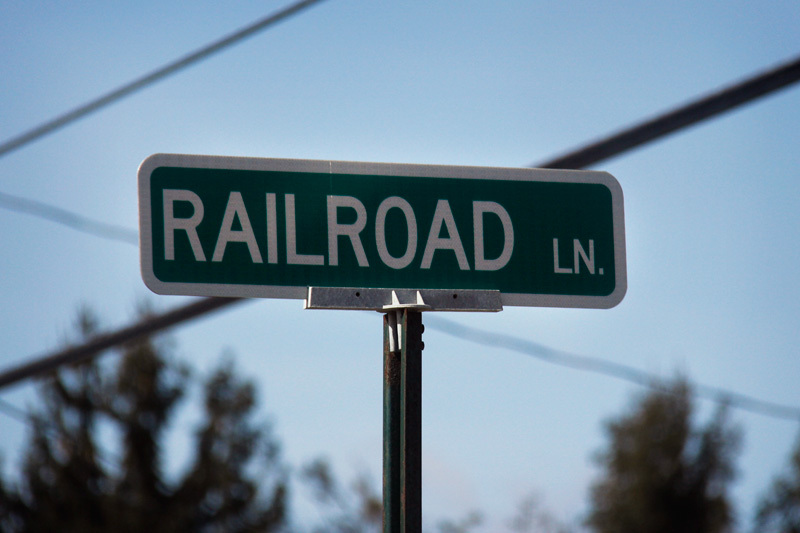 The railroad has always been a great method of getting around, and there are plenty of places you can see by train. If you’re looking for something more local, Metro-North will be having their Staycation Showcase in Grand Central next week. Amtrak also has a wide variety of places to vacation, all accessible by rail. Despite all of these offerings, rail travel really isn’t the primary method that most people go on vacation these days. After getting patted down by your friendly neighborhood TSA, airlines can whisk you away to the other side of the country in a matter of hours, not days. And America’s love affair, the automobile, offers a more individualized and customizable trip across our nation’s Interstate system. 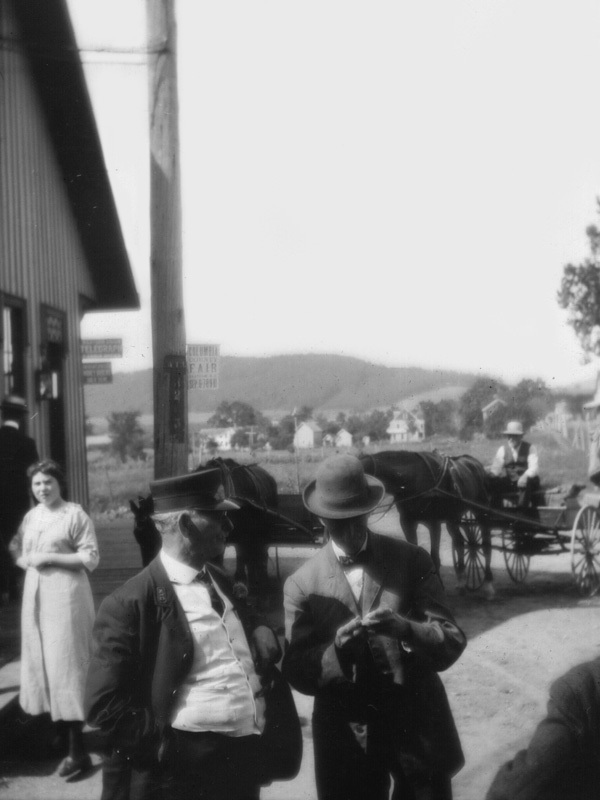 However, neither of these options were available to folks living in the early 1900s. 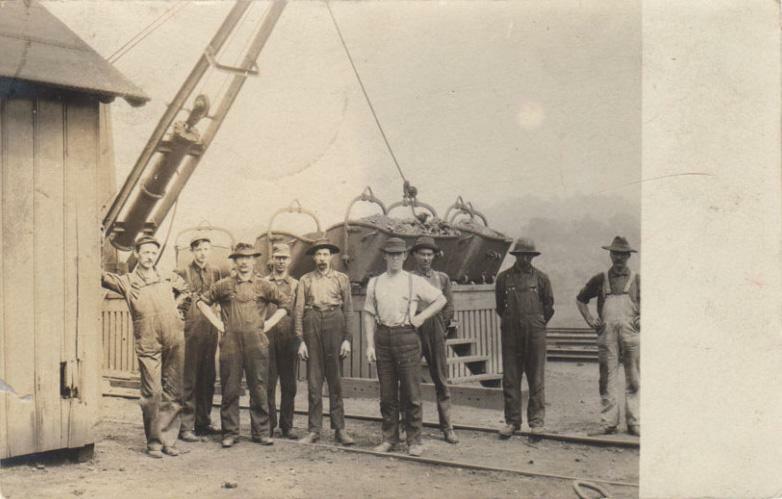 Rail was the way to go, and the best way to take a vacation. 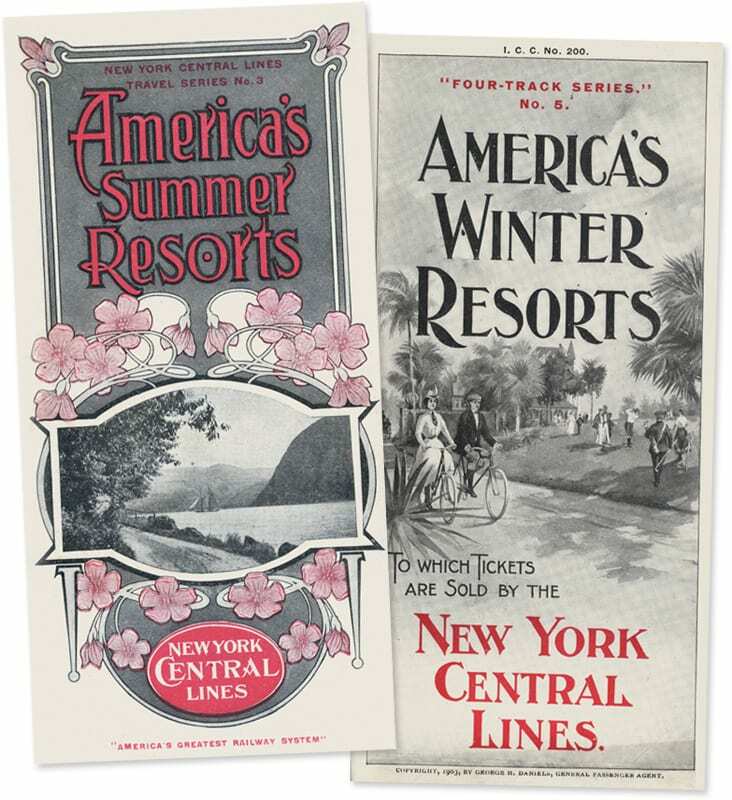 Vacation brochures printed by the New York Central in 1908 and 1903. Vacation packages, including rail tickets, were offered by the New York Central, and they printed many varieties of brochures advertising all the places one could visit. 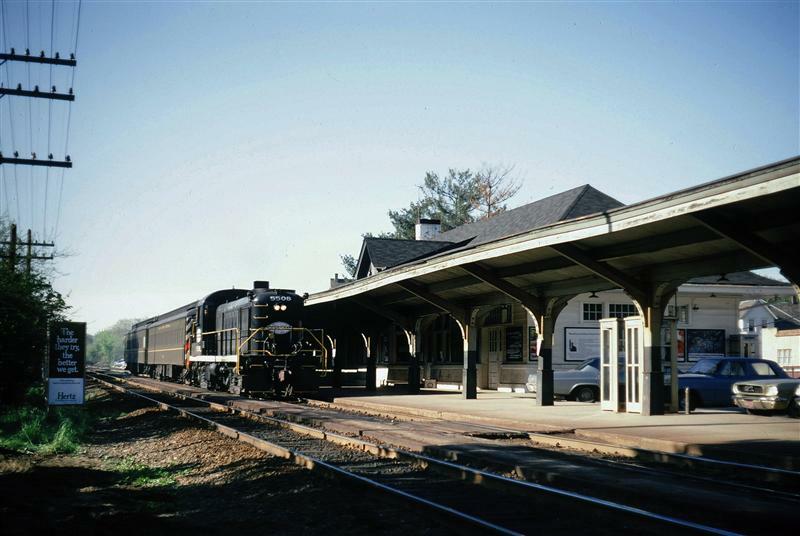 Summer resorts included in-state locations, like Niagara Falls and the Adirondacks, and some faraway places like Canada, Michigan, and even Yellowstone National Park – an 82 and a half hour trip from Grand Central Terminal, at a round trip fare of $97.80. 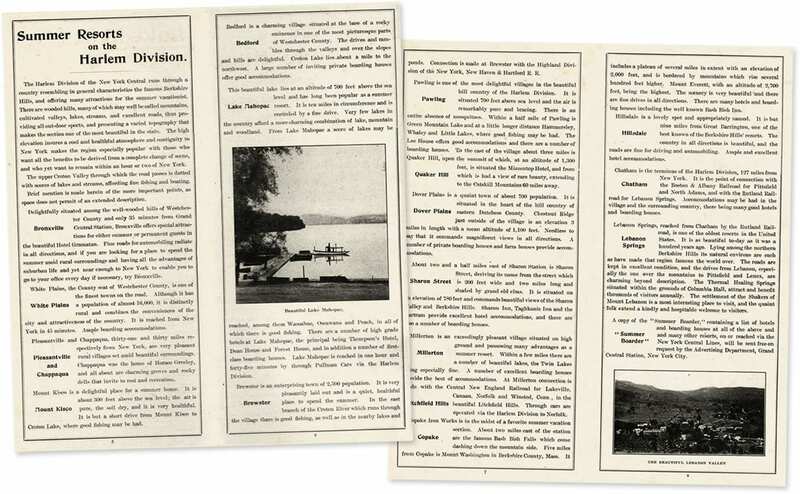 The winter resorts booklet might prove to be the most interesting – it offered long distance vacations to warm locales around the world – places that one would reach after long journeys via train and steamship. Setting out for “one of ‘Uncle Sam’s’ new possessions” – “Porto Rico” – would be a 20 day affair in total. 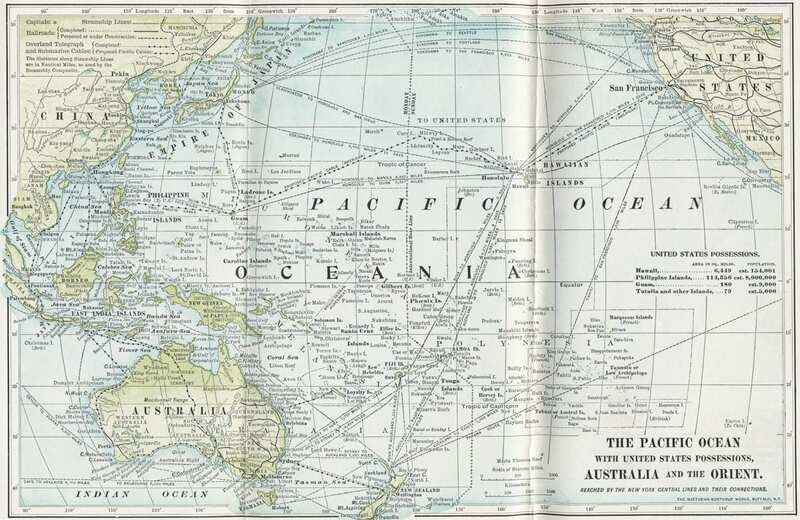 The most fascinating part printed is certainly the map of the Pacific Ocean found at the back of the brochure, labeled as places “reached by the New York Central Lines and their connections.” If you had the time, and the money, you could certainly reach the Empire of Japan, and beyond. Straying not too far from home, a traveler could reach Honolulu by steamship from San Francisco in a total of seven days. 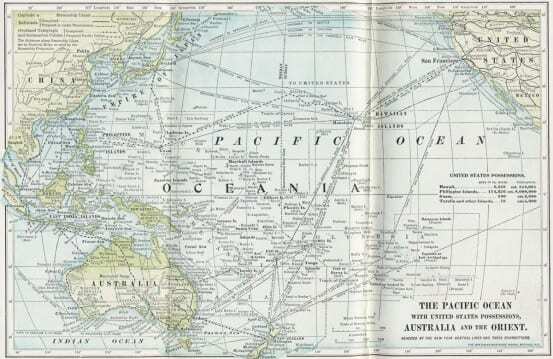 Map of the Pacific Ocean, printed by the New York Central in their 1903 America’s Winter Resorts brochure. Interested in staying closer to home, or taking a shorter vacation? The New York Central also had a brochure of journeys taking two to fifteen days. 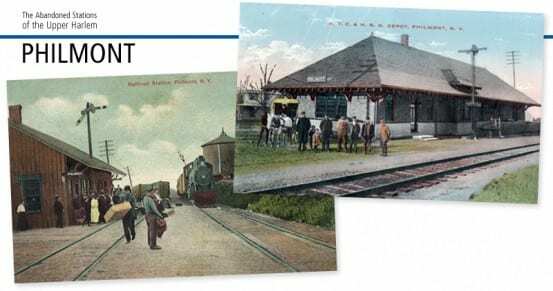 Two days could get you to the Adirondacks or Lake George, four a nice trip to Montreal, eight a meandering journey to and from Quebec, and fifteen a wonderful itinerary stopping at several different resorts in many of the aforementioned spots. 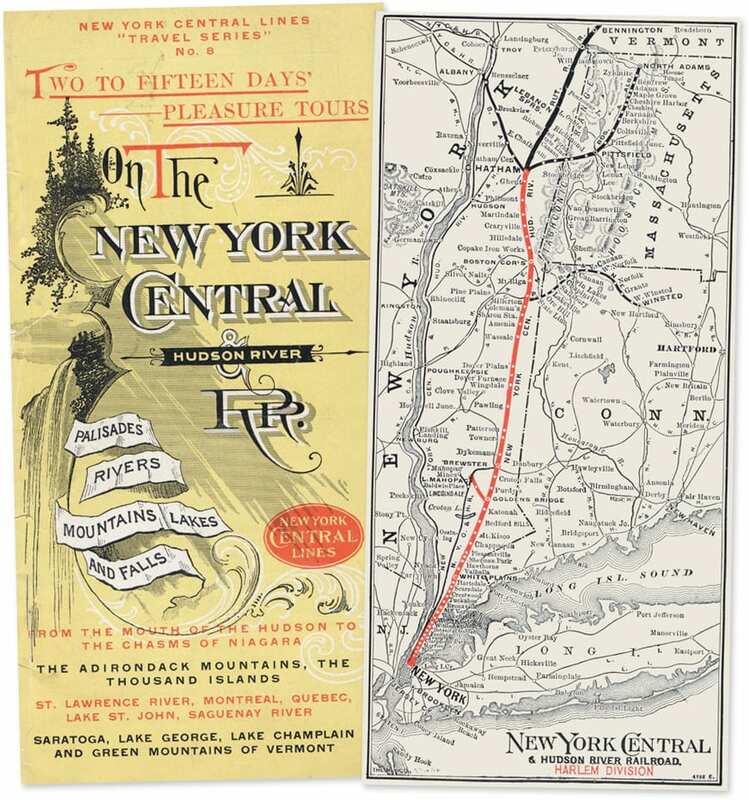 Brochure of two to fifteen day journeys from 1912, and the Harlem Division map within. 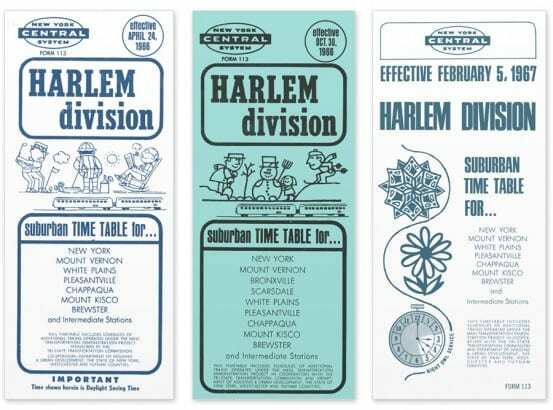 If you’re really looking to stay in your own backyard, there were plenty of vacationing spots along the Harlem Division. 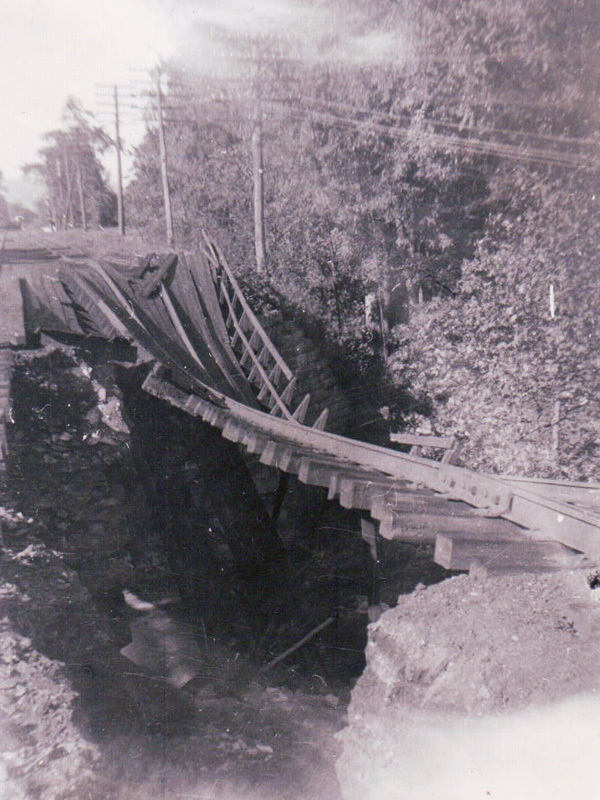 The Harlem’s long-gone Lake Mahopac branch was established especially for that purpose. 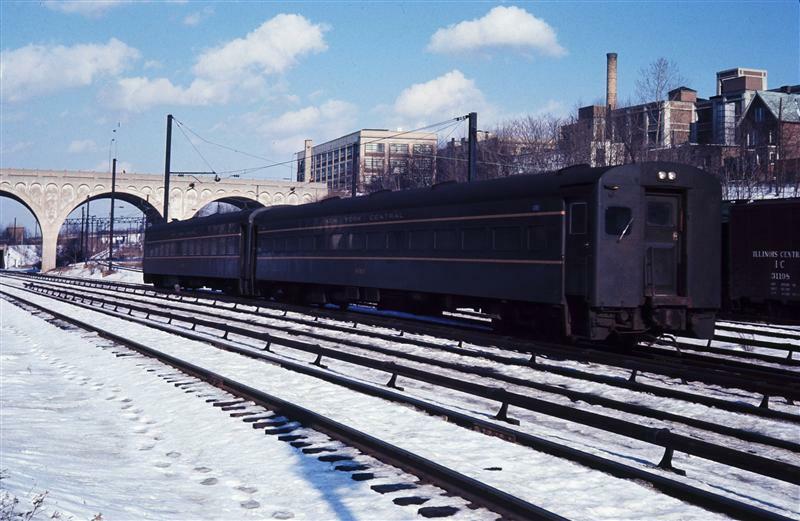 But as you can see from the map above, one could get more places via the Harlem than you can today – transfers were available in Chatham for the Boston and Albany Railroad to Massachusetts, and to the Rutland Railroad for Vermont. 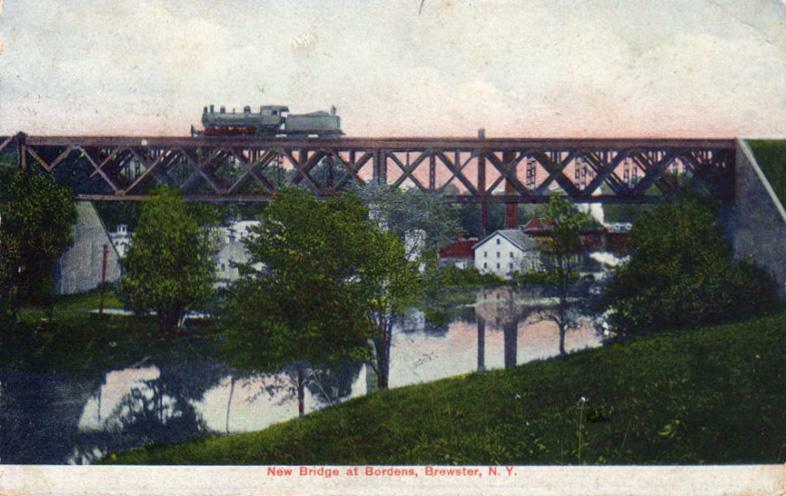 Close to home – summer resorts along the Harlem. 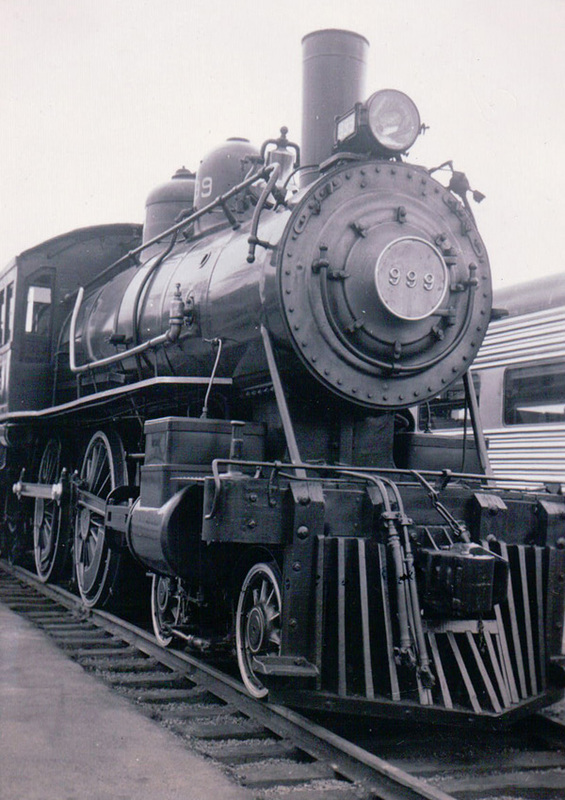 Anybody out there planning on taking a vacation (or a “staycation,” even) by train this summer? Drop a note in the comments about where you’re planning on going! As we complete our journey along the abandoned Upper Harlem Division, it is worth taking a moment to look at the timetables printed for the line. 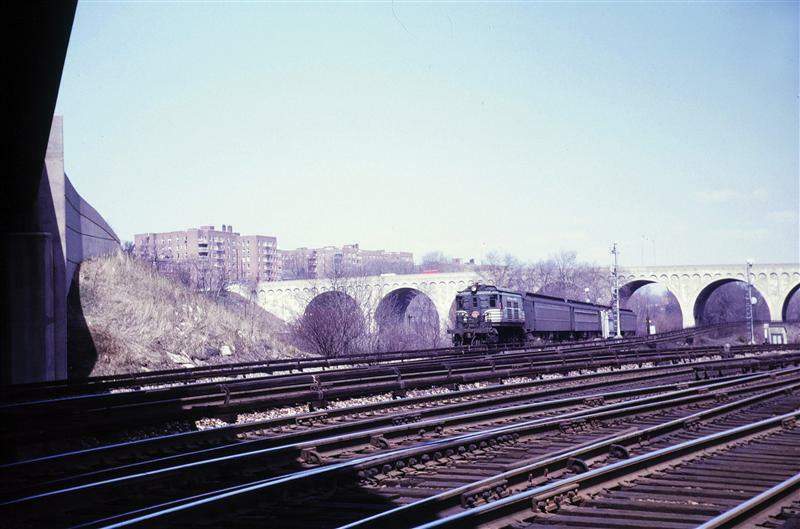 The Upper Harlem’s timetables were New York Central’s Form 112 – and its size changed drastically over the years, reflecting the railroad’s slow death. A 1909 timetable, which was actually a foldout booklet that contained descriptions of the stations and schedules for connecting railroads, was actually 32 pages. 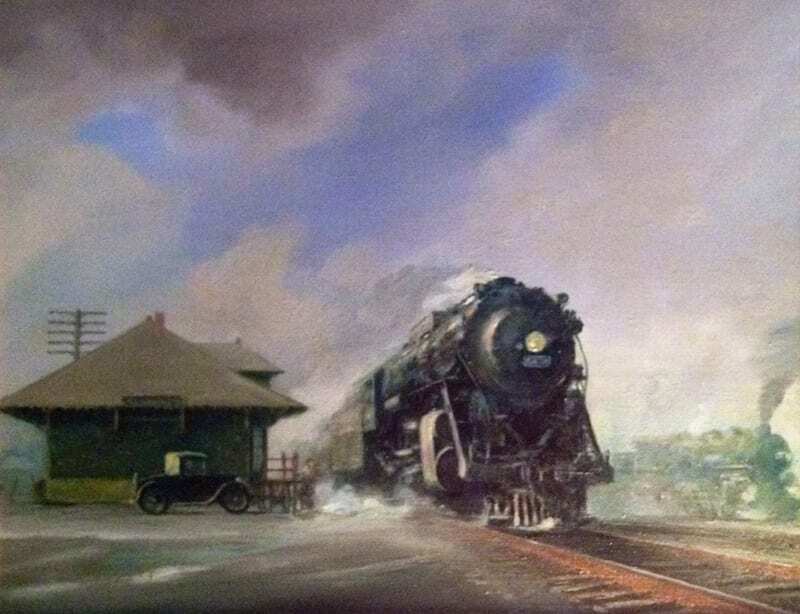 The tall size seen in a later 1939 timetable was standard for many years, and it featured the additional trains offered beyond Chatham to Pittsfield and North Adams. 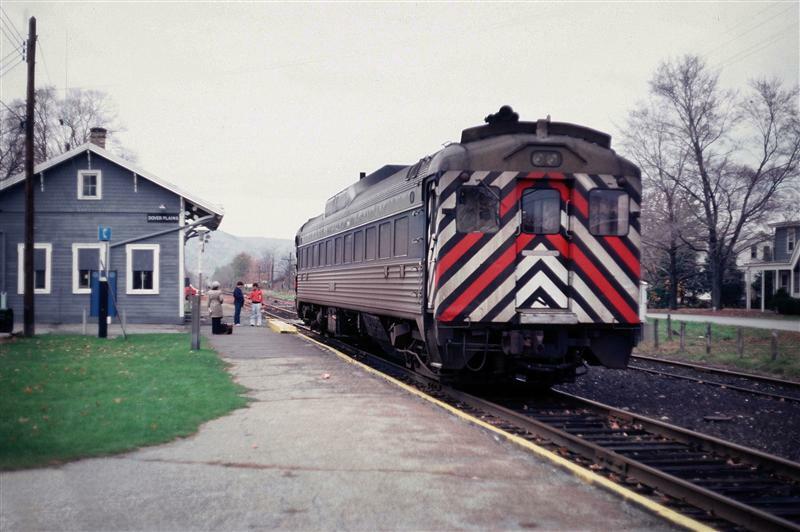 Many changes came in the 1950’s – timetables got smaller when the North Adams service was cancelled, and by 1953 the four panel foldout was reduced to three panels. 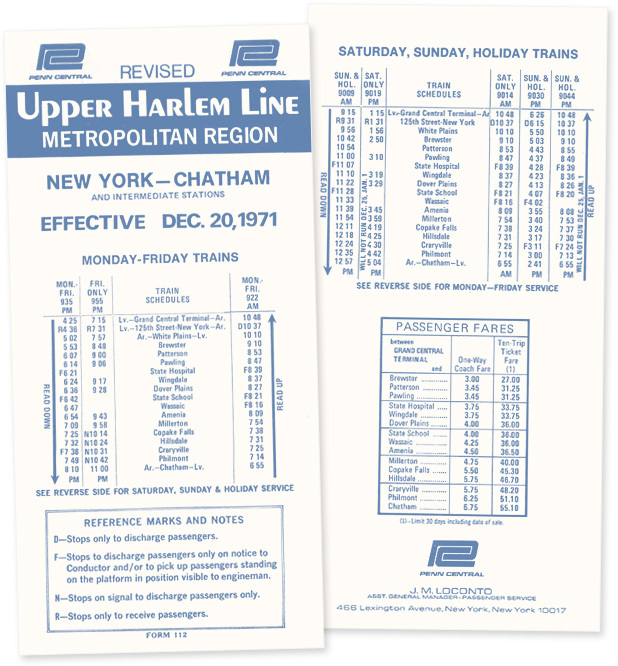 By the time the Upper Harlem Division’s passenger service was cancelled in 1972, the line timetable was just a double sided card, reflecting the only two trains that operated on the line every week day. 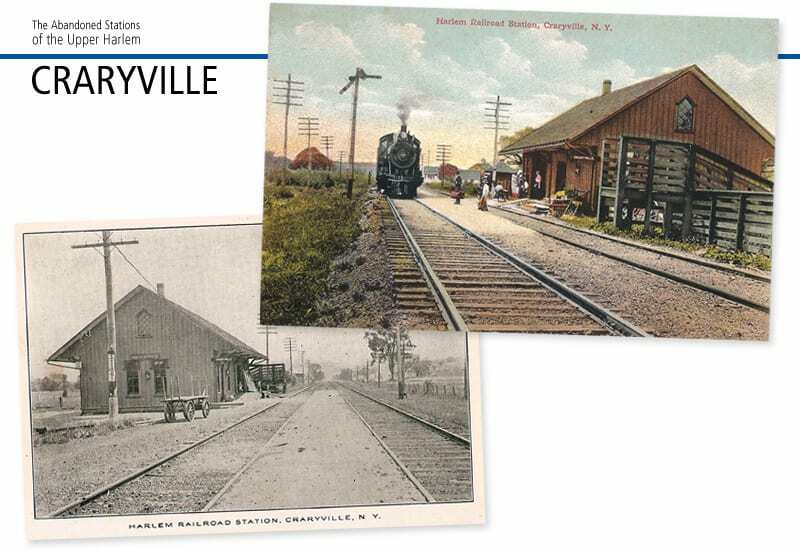 Moving on, we continue our tour north of Hillsdale, heading towards Craryville. 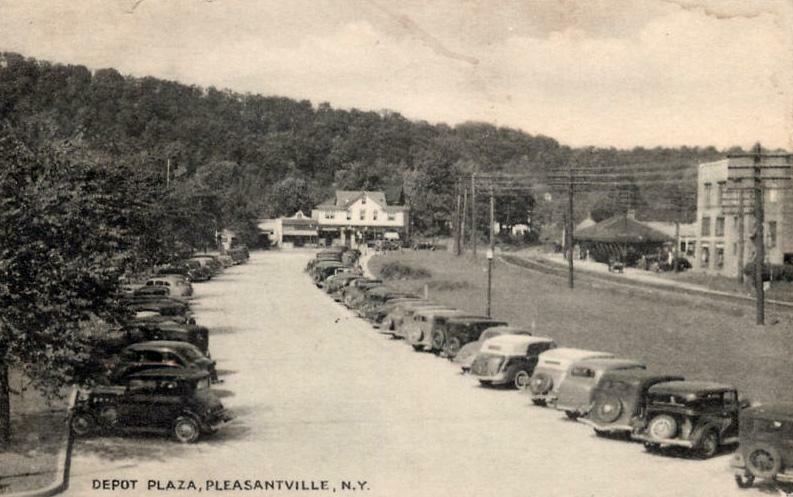 For much of its route, the Harlem Division follows New York State Route 22 northward, but after arriving at Hillsdale the route turns in a westward direction to follow Route 23. 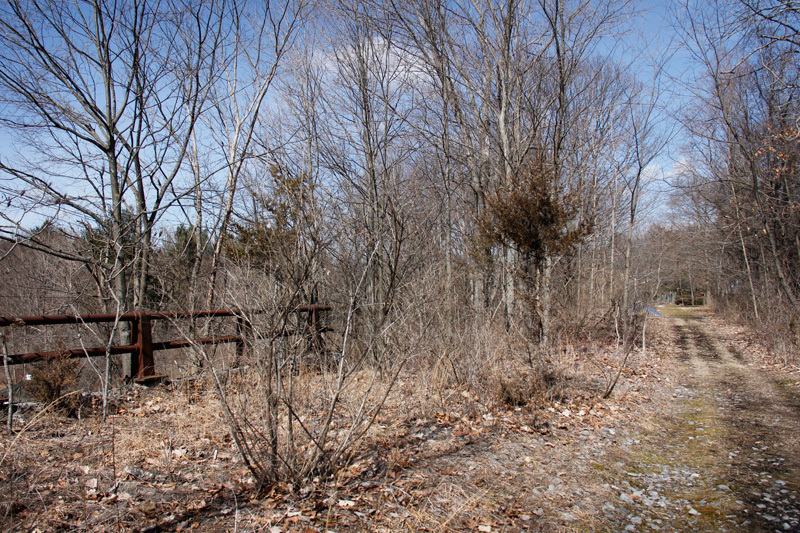 Craryville is a relatively quiet area, with little reminder of the railroad beyond a barely paved Railroad Lane. 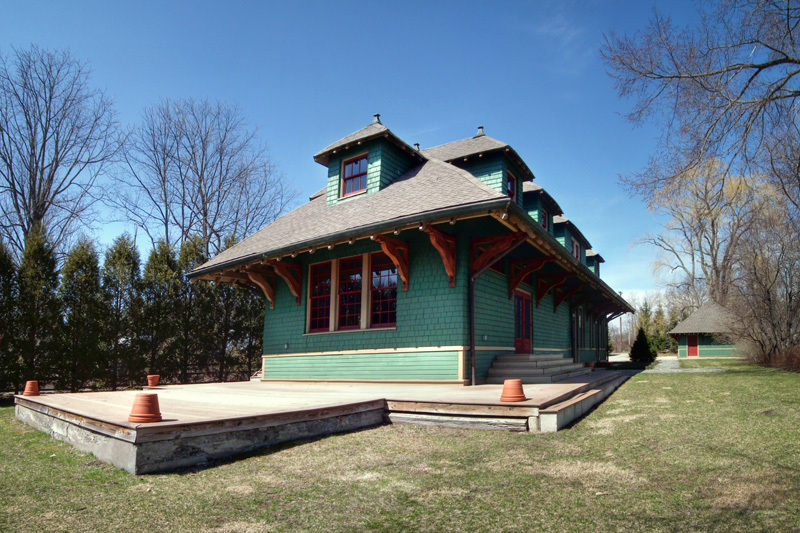 The old station house still exists, but is privately owned. 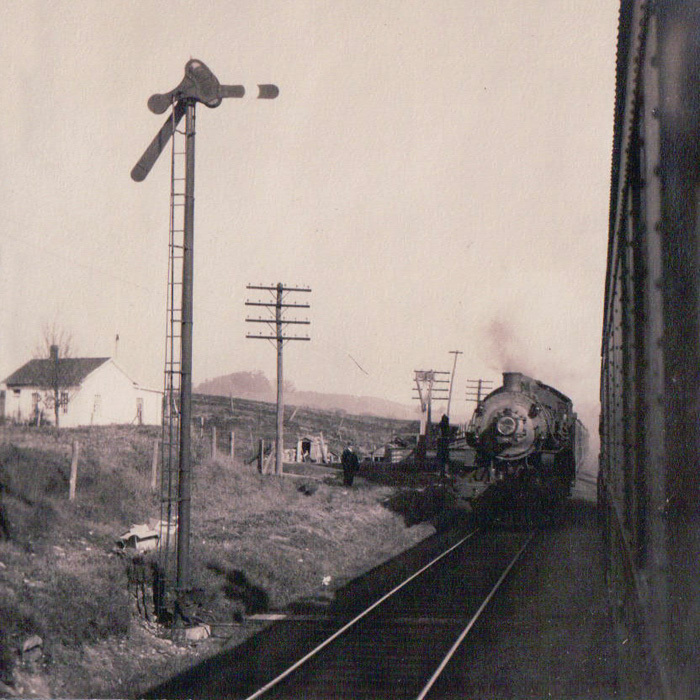 The name Martindale derives from John Martin, on whose land the original Martindale station was built upon. 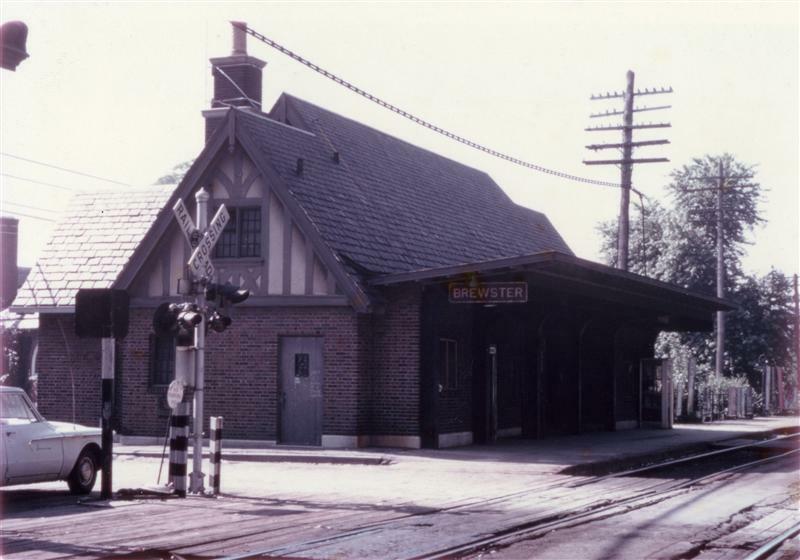 It was never an extremely prominent station, and by 1946 it was just a mere flag stop on the line. 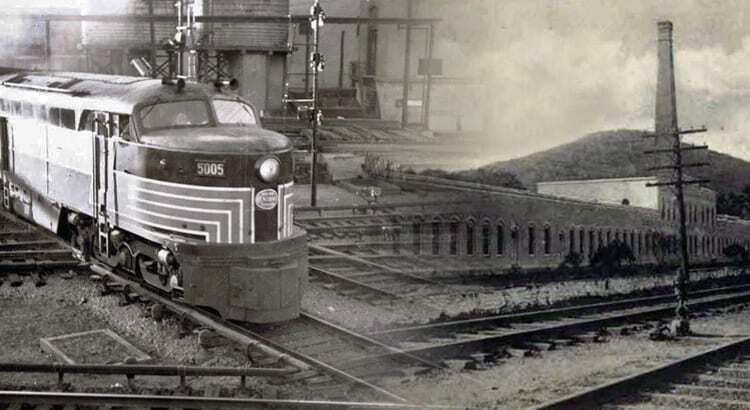 Martindale met its end years before the rest of the line, and was eliminated in 1949. 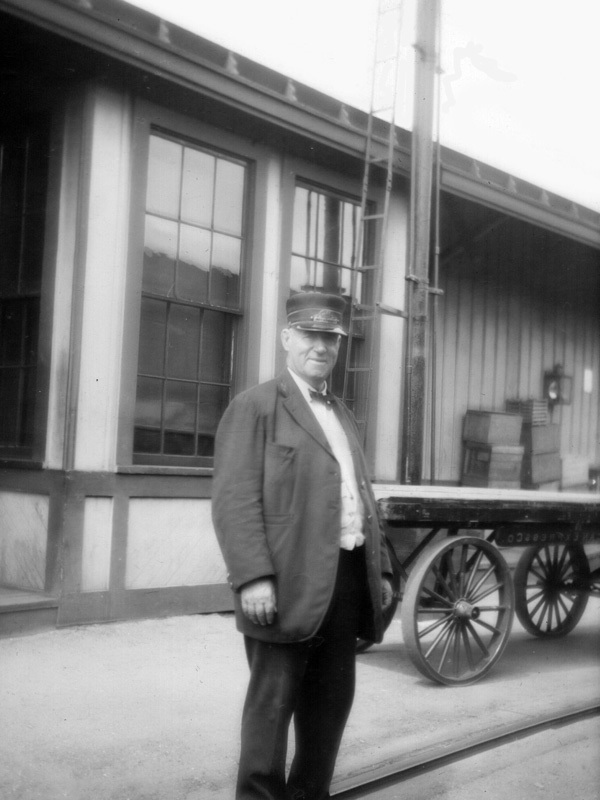 The station building itself was dismantled by a railroad employee in that year. 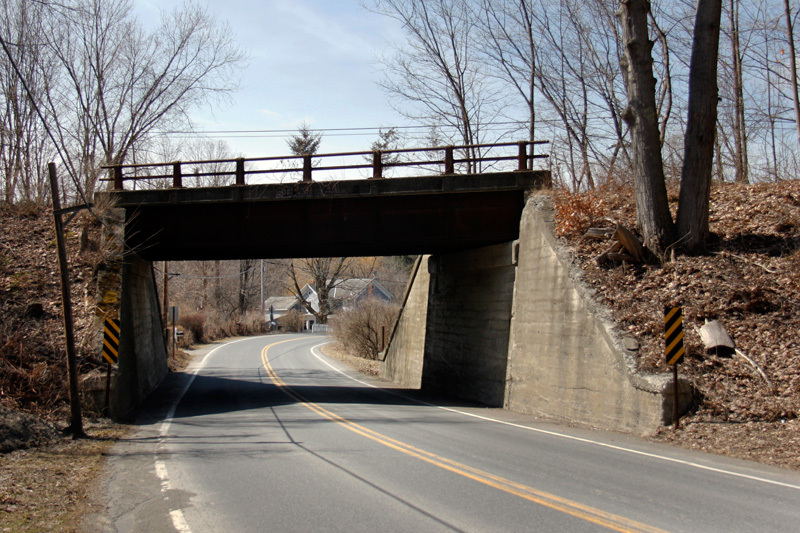 South of where Martindale station was lies an overpass where the railroad traversed over Route 23. 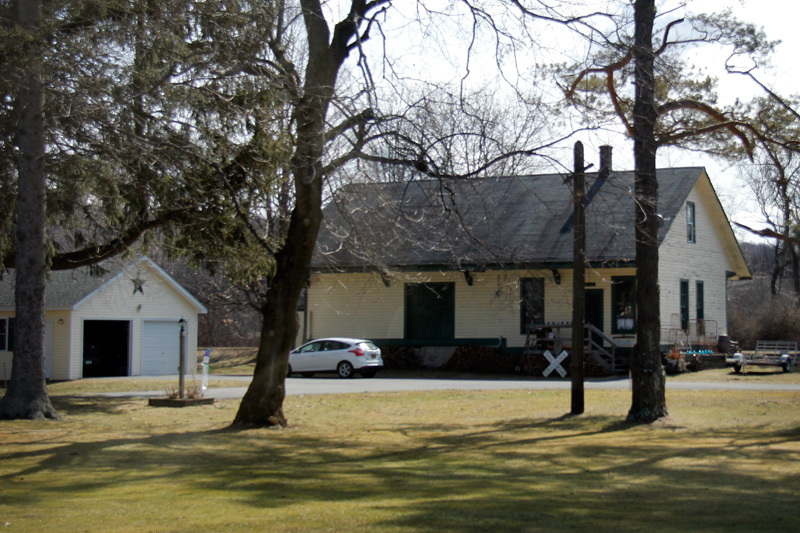 Little else in the area reflects the area’s railroading past. 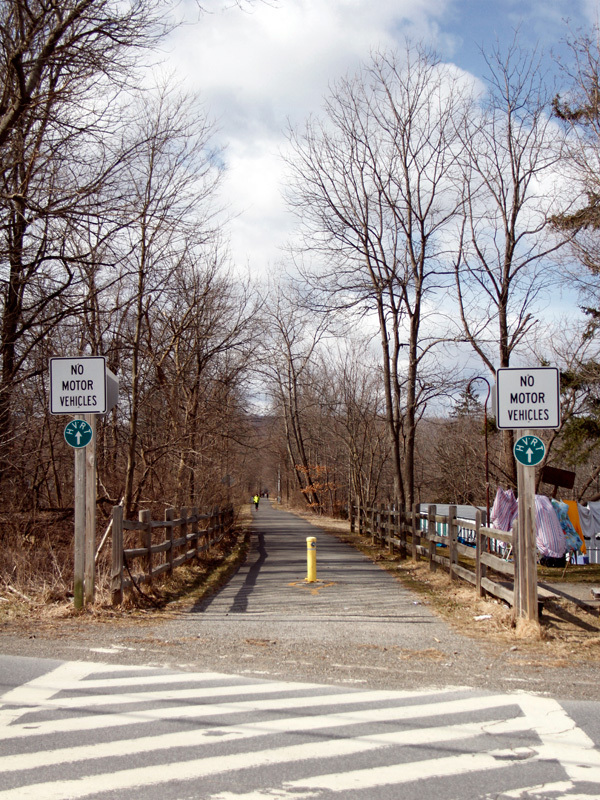 In fact, little even bears the name Martindale besides the Martindale Chief diner, located next to the Taconic. 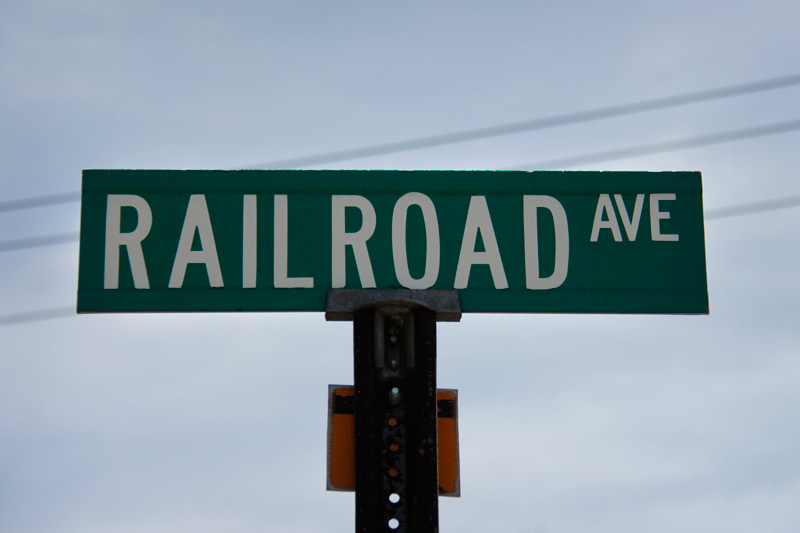 Besides Railroad Avenue, and the former railroad hotel located upon it, it is hard to tell that a railroad once crossed Main Street here in Philmont. 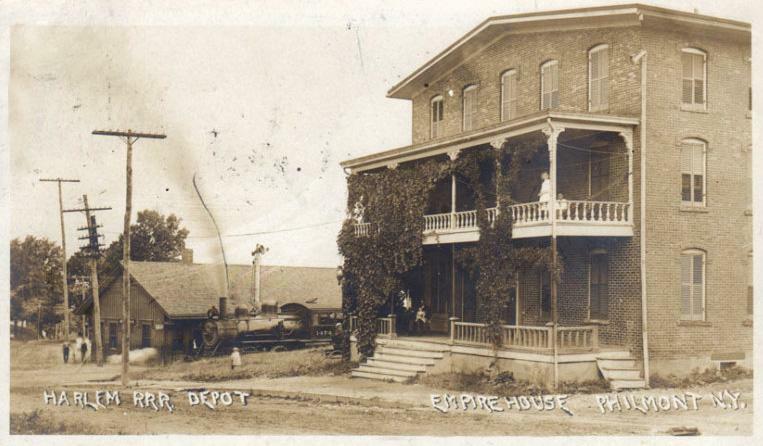 The Empire House, the aforementioned railroad hotel, lacks the porches it had in historical images and may be a bit beat up, but it is one reference to the railroad that ran through town. 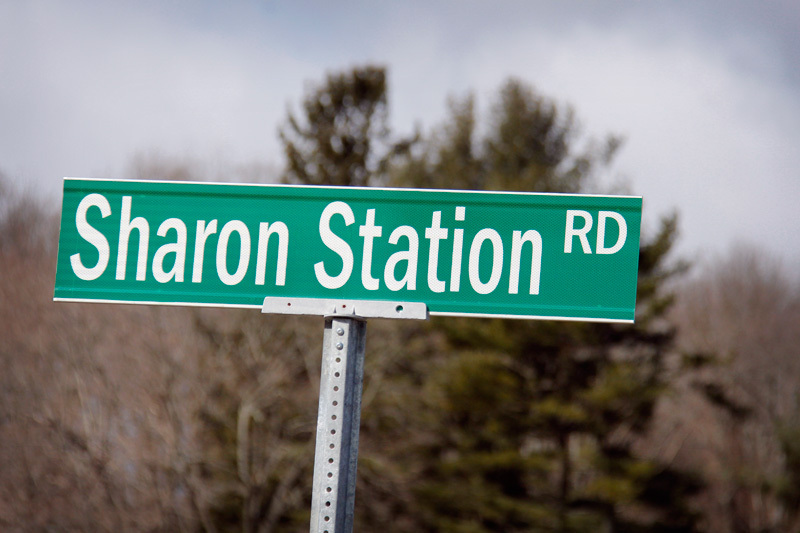 Leaving Philmont, about three miles north of the station, but in the town of Ghent, lies a street named Arch Bridge Road. 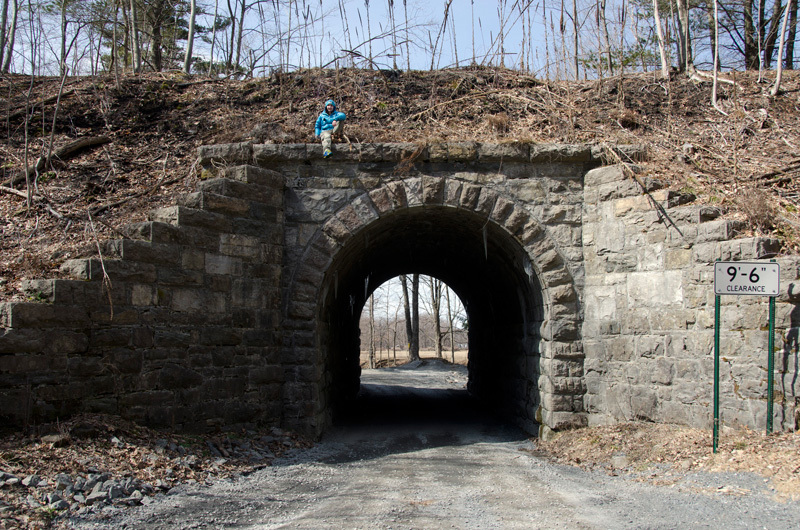 The eponymous arch is a single lane underpass, with the railroad’s former ROW running above. 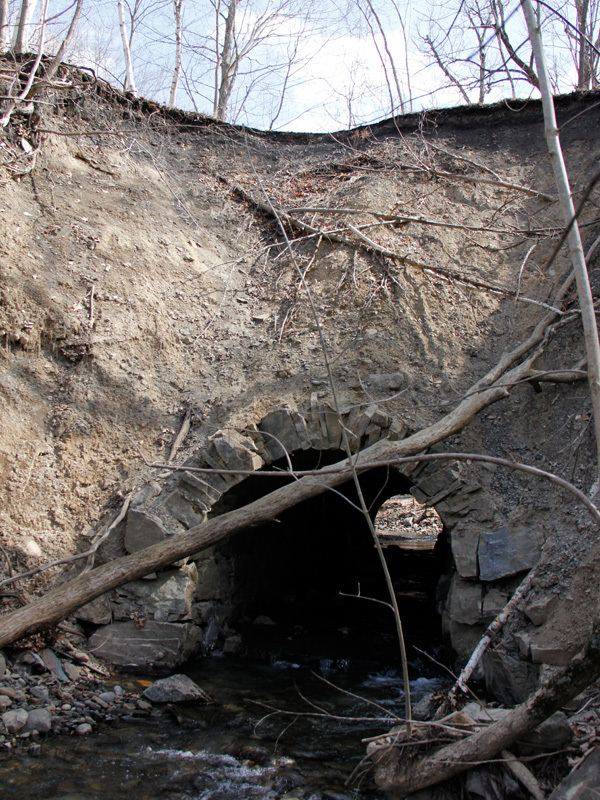 Running along the side of the arch is a small stream where, at some point over the years, some of the railroad’s roadbed washed out. 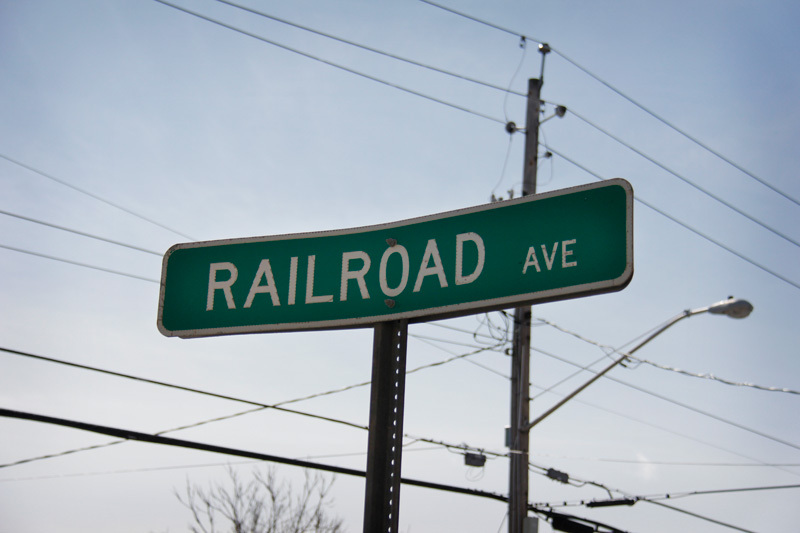 It is a nice vestige of the railroad in Ghent, and most certainly an old one. 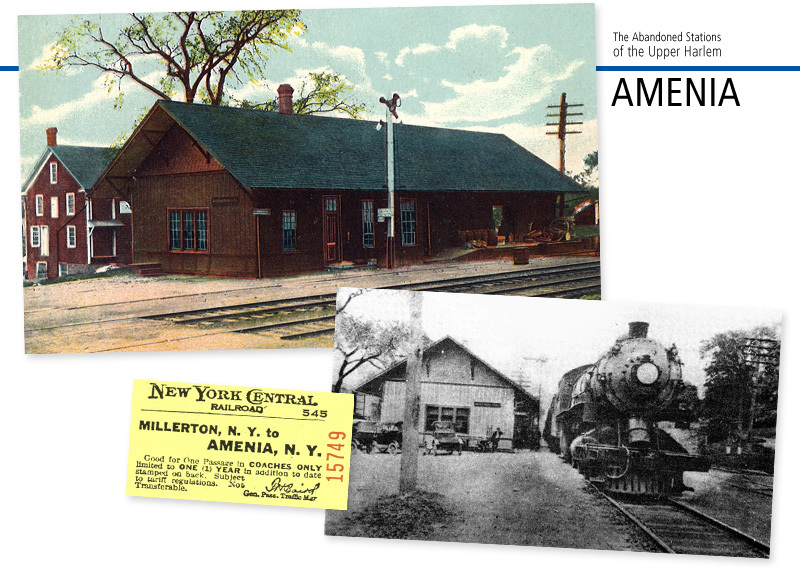 Just under 125 miles from Grand Central lies the second to last station on the Harlem – Ghent. 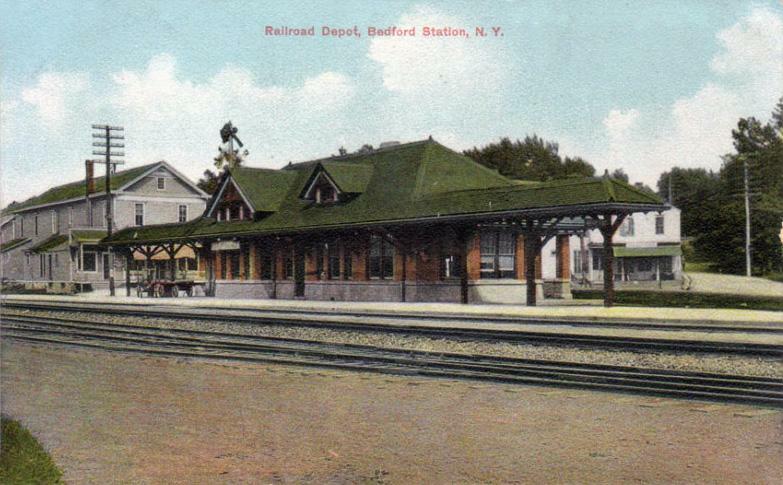 The station itself was shared with a short branch of the Boston and Albany. 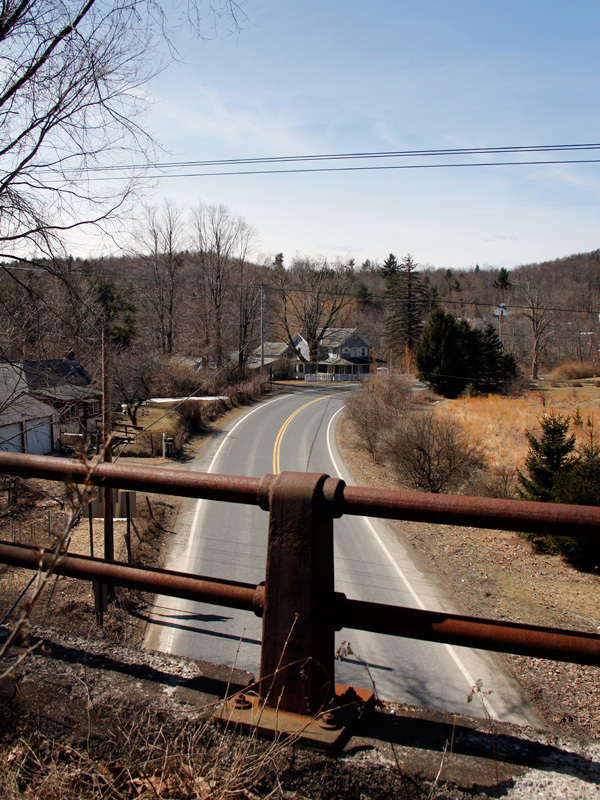 The railroad crossed over New York State Route 66 just south of the station. Splitting off from Route 66 at the center of Ghent is Railroad Avenue, which still exists today, although with no railroad to be seen. 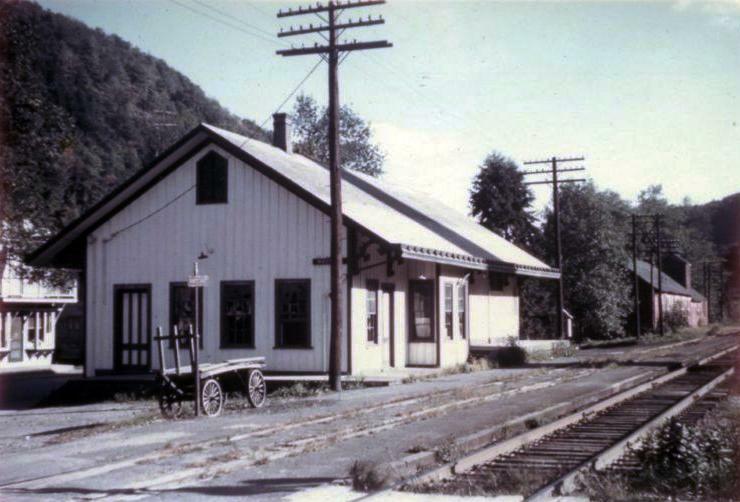 Appearing in many historical photos of the station is the Bartlett House, which was a railroad hotel, and still stands today. 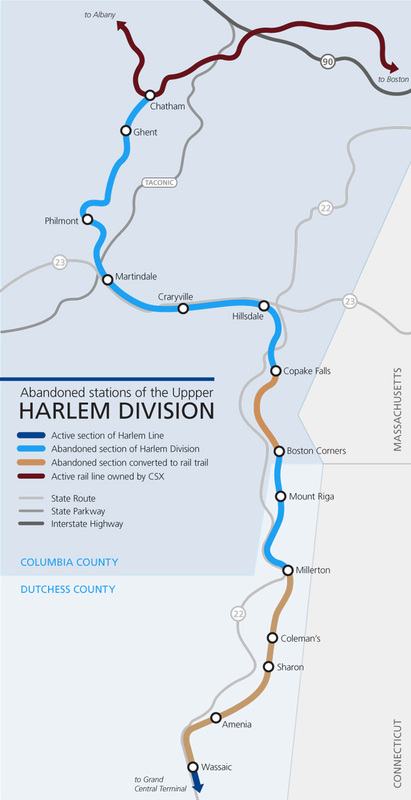 The end of the Harlem Division, just a bit more than 127 miles from Grand Central Terminal, is in Chatham, New York. 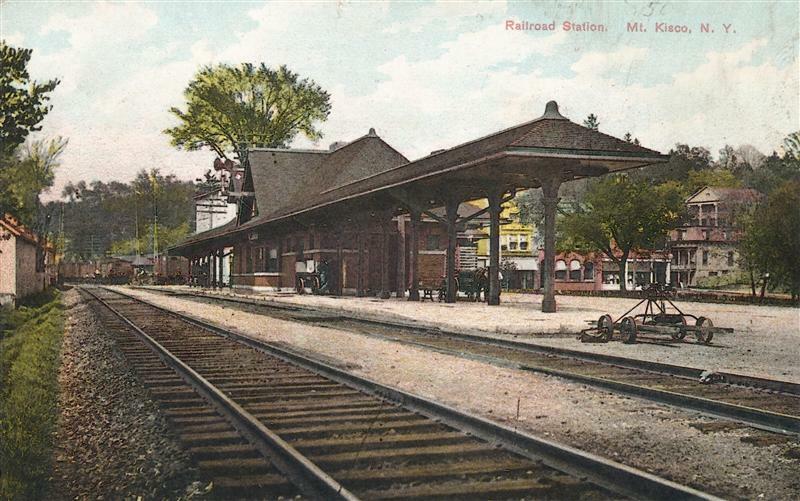 The Harlem met with the Boston and Albany and the Rutland Railroad here, and the former two shared a quite beautiful Union Station. Stylistically, the station’s Richardsonian Romanesque aesthetic matches more to the Boston and Albany than it does to the Harlem, but it is attractive nonetheless. 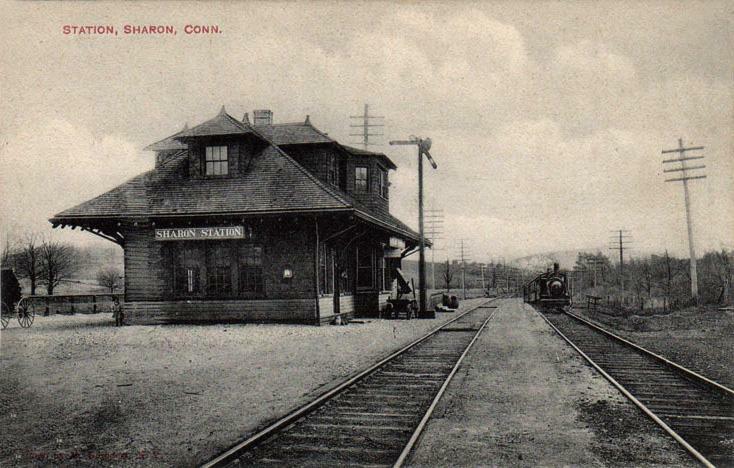 Built in 1887, Chatham station was designed by Shepley, Rutan and Coolidge, the successors to famed American architect Henry Hobson Richardson. 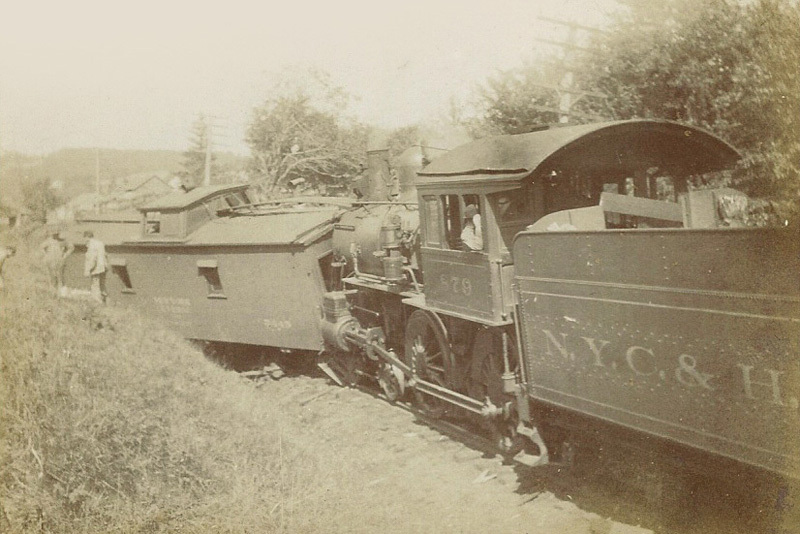 The New York and Harlem Railroad always seemed to be a modest affair. 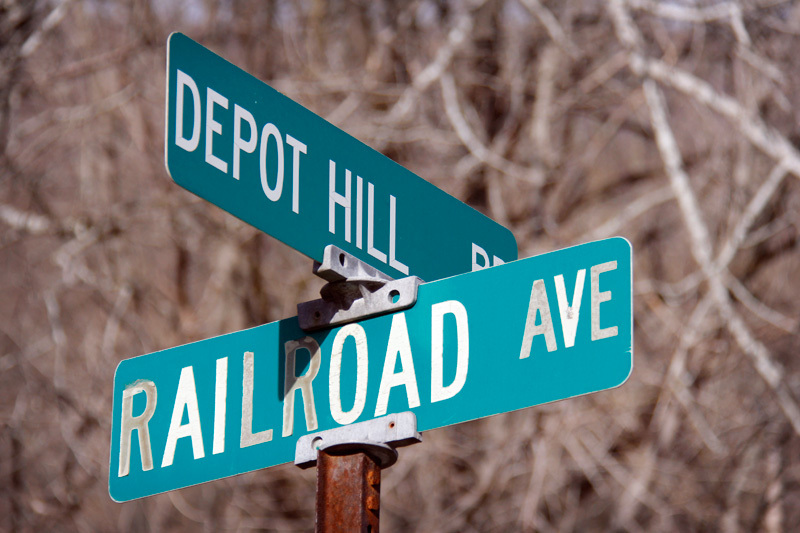 Some railroads chose grandiose names for themselves, dreaming of the locations that they would one day reach (and often fell short of – the New York, Boston and Montreal Railway comes to mind), but when it was chartered in 1831, the Harlem only planned to be a link from the core of New York City to Harlem just a bit further north. 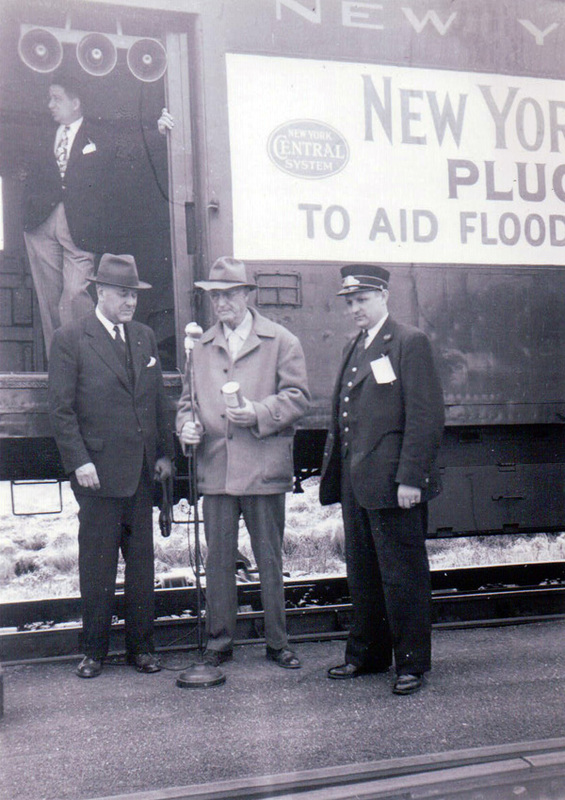 The original plan was to connect with the New York and Albany Railroad at Harlem – except that railroad was never completed. 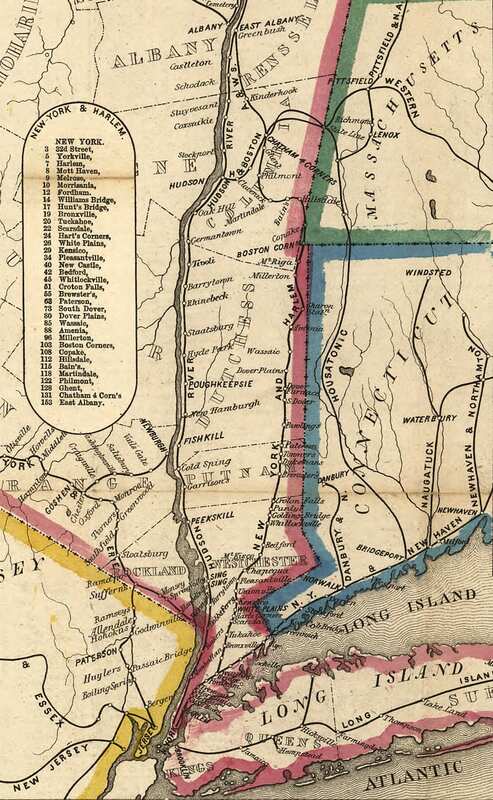 In their absence, the Harlem was granted the right by the state legislature to build into Westchester in 1840, and all the way to Albany in 1846. 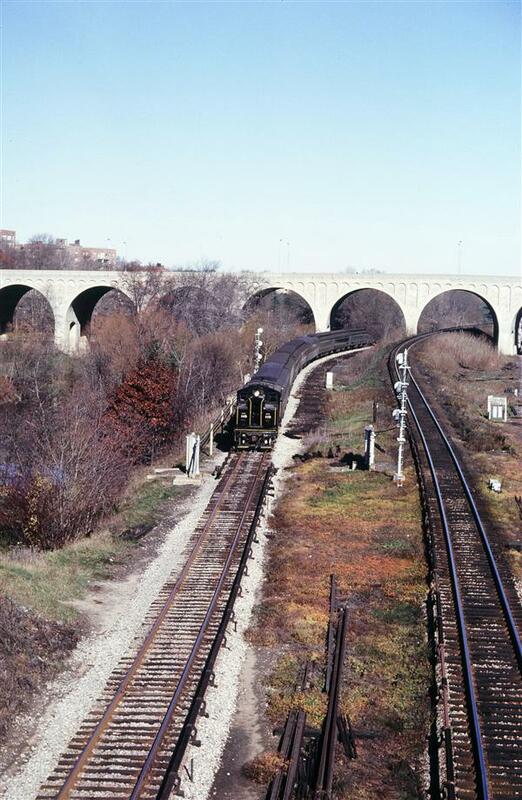 Despite that right, the Harlem gradually extended north, and instead chose Chatham to be its terminus. From there, riders could easily continue to Albany on the B&A, and some of the earliest timetables show the trains on this additional route. 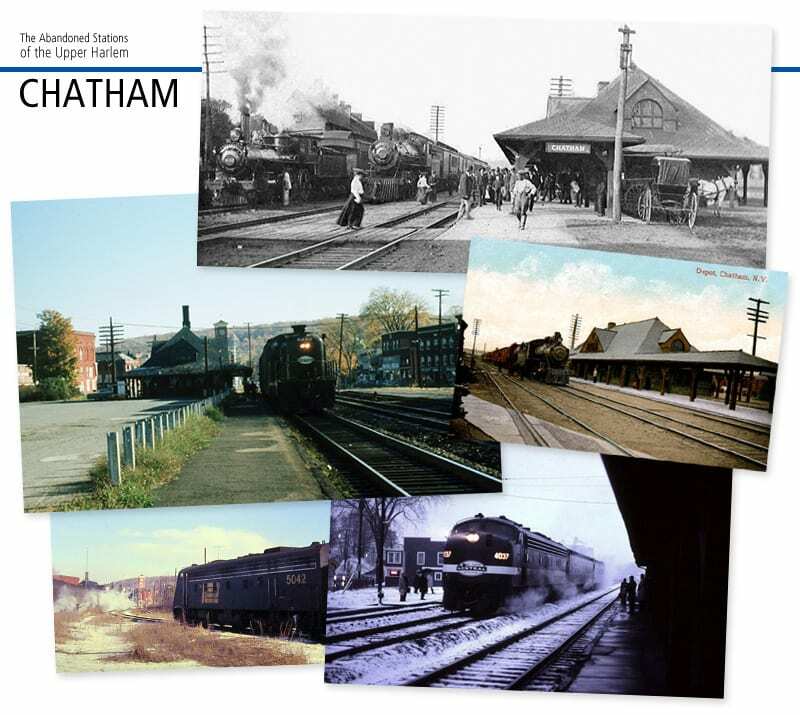 For over a hundred years the railroad has been an important part of Chatham’s identity. Though both the Rutland and the Harlem are gone, the Boston and Albany’s former line still runs through Chatham, owned by CSX. 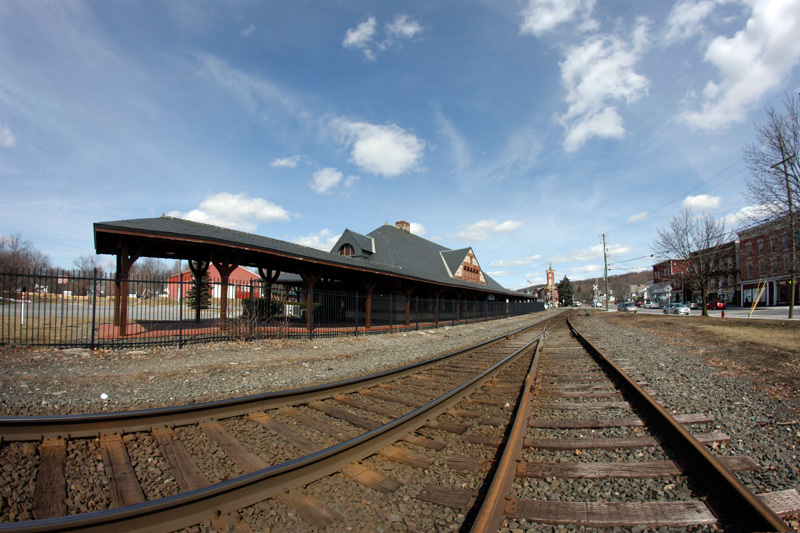 The trains may run through, but they don’t really stop here – though the town seems to firmly hold onto their railroad identity. A fence has been put up to separate the former Union Station from the remaining tracks, which somewhat mars the attractive vista of yesteryear. 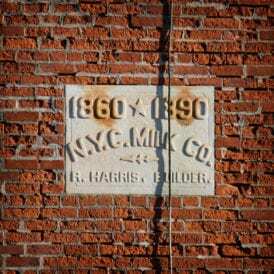 The building had significantly fallen into disrepair by the ’60s, but it has been restored to glory and is the home to a branch of the Kinderhook Bank. 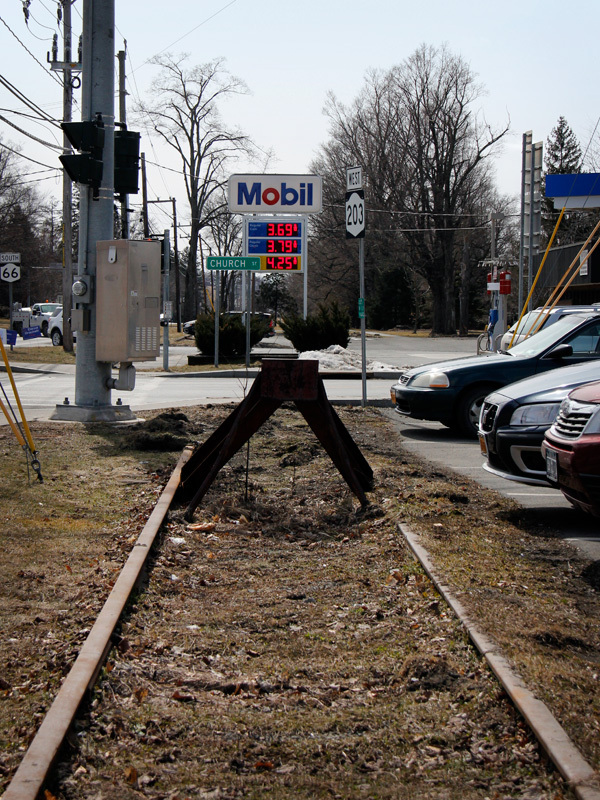 The very end of the Harlem’s tracks still exists, and extends around a half mile south, where they abruptly end in front of a gas station. 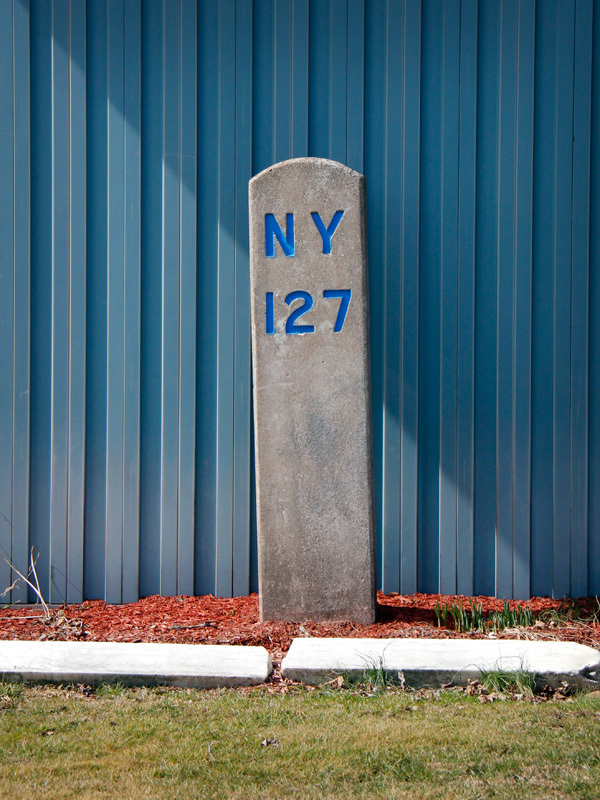 The mile marker for mile 127 – the end of the Harlem – has been saved and transplanted to a garden in front of the Chatham firehouse. 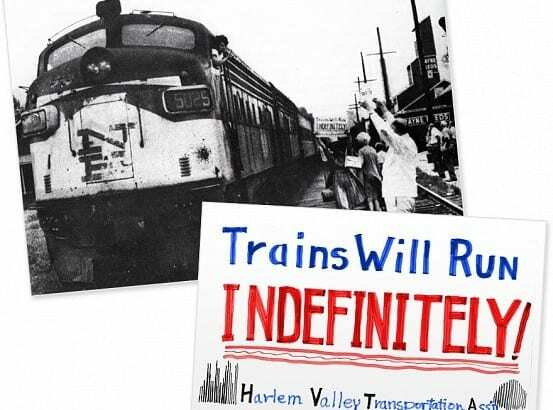 As we’ve seen on our tour of the former stations of the Upper Harlem Division, many of the locales have changed drastically over the 41 years that passenger service has been absent. 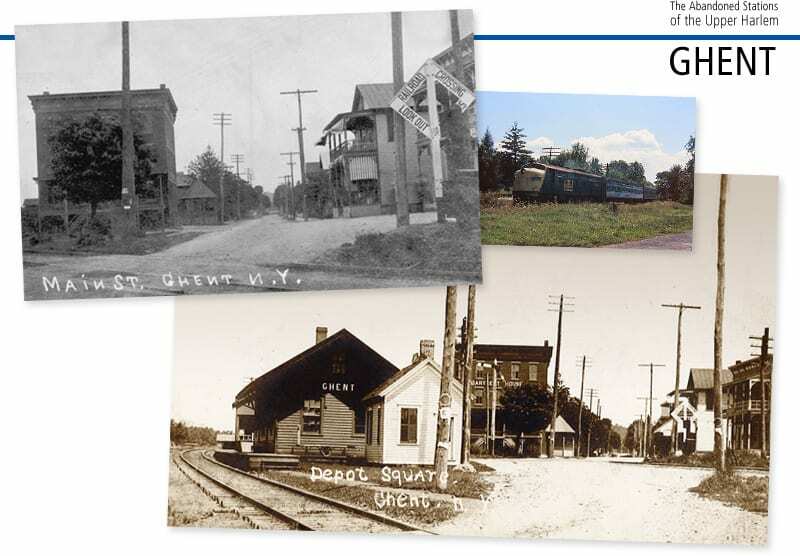 But two towns along the route provide an interesting look back and allow us to compare today and yesterday. 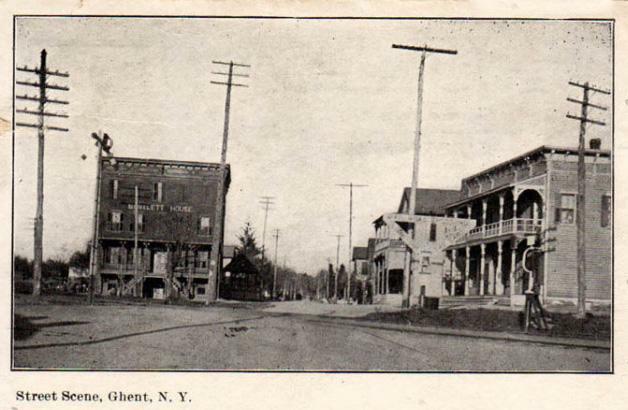 Both Philmont and Ghent had railroad hotels that were established close to the tracks. Because of that proximity to the rails, the buildings appear in many old photos – which makes a comparison especially moving. 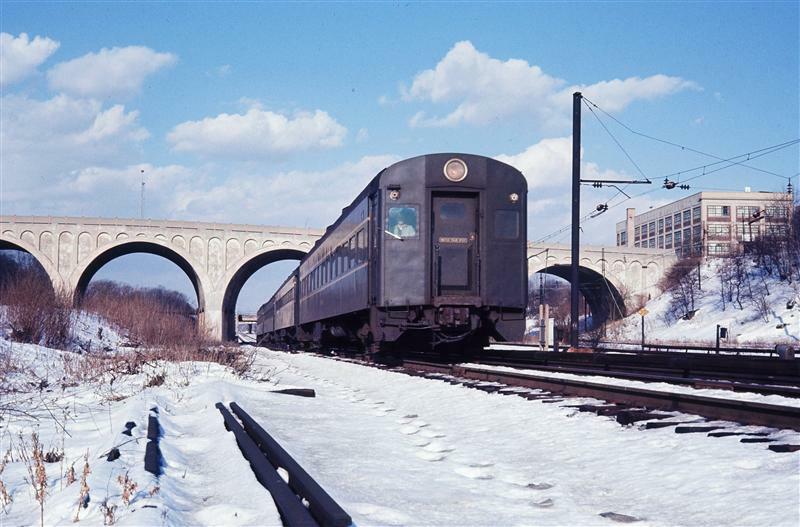 The two hotels may have come to town because of the trains, but they managed to outlive the demise of the Harlem itself. 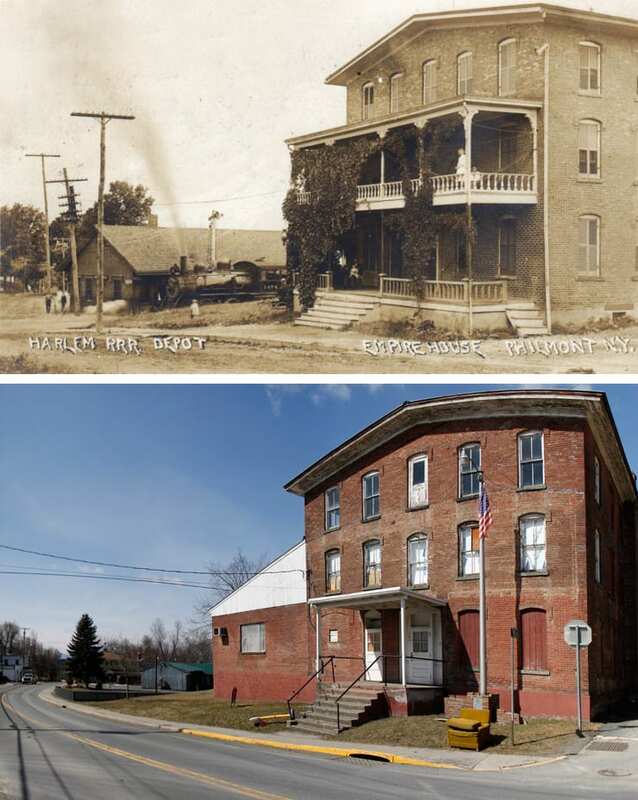 Philmont’s Empire House was built sometime in the 1880’s, and also included an Opera House. 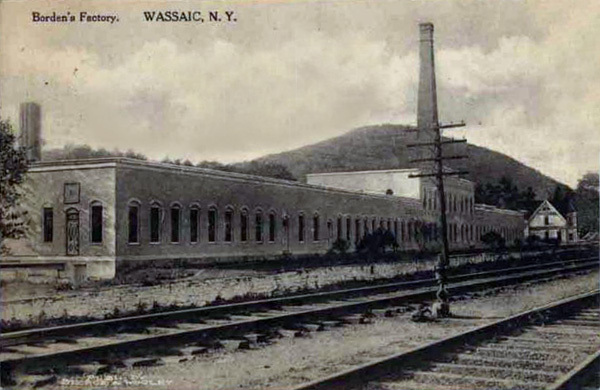 After the hotel was long gone, the building was converted to serve as a textile manufacturing facility. 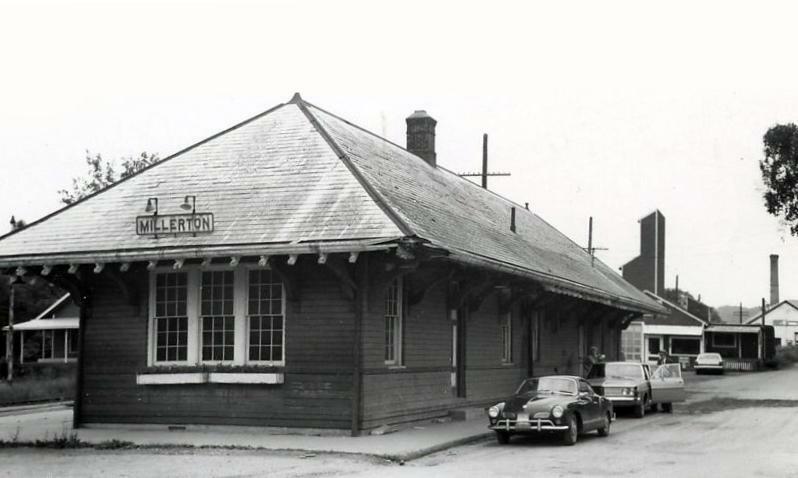 At some point in the ’60s Philmont’s American Legion purchased the building. They added a 30 foot by 70 foot section to the building, which included a kitchen. 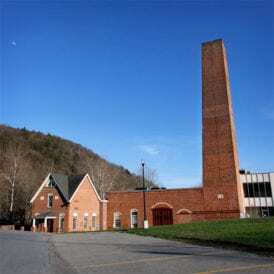 Due to the post’s declining membership, the members voted to put the building on the market in 2009. 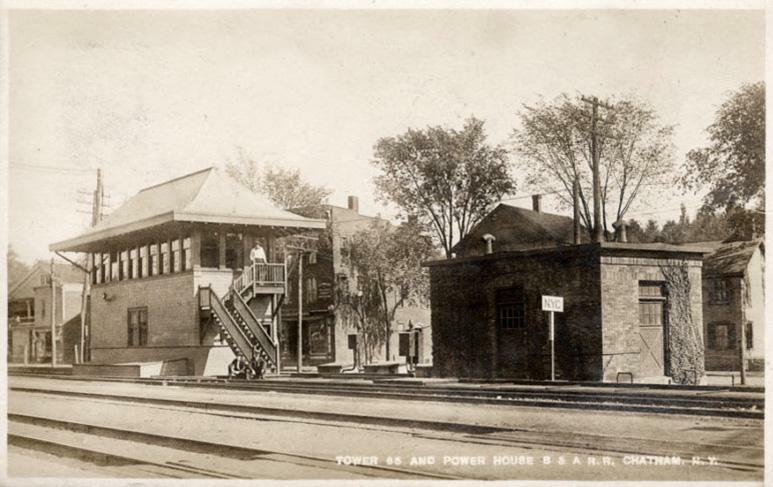 Though the main structure of the building is similar to the above historical view, the original porches are gone from the building. 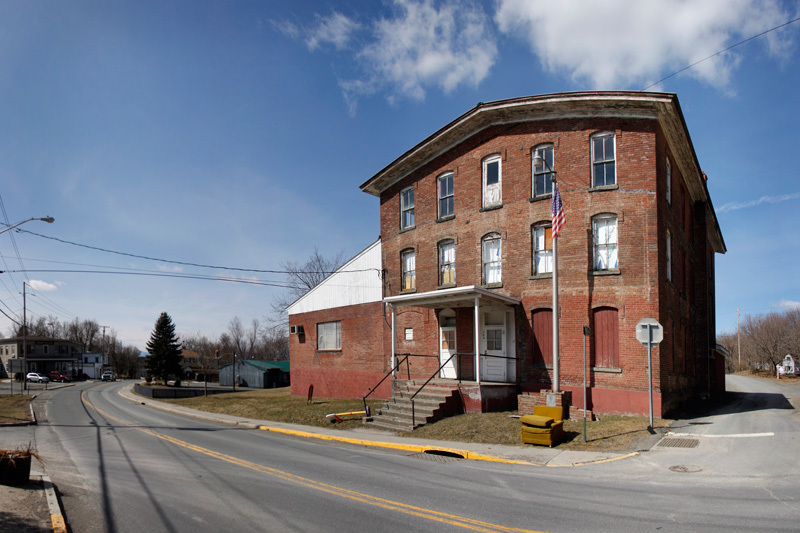 The addition made by the American Legion is also apparent to the left of the building. 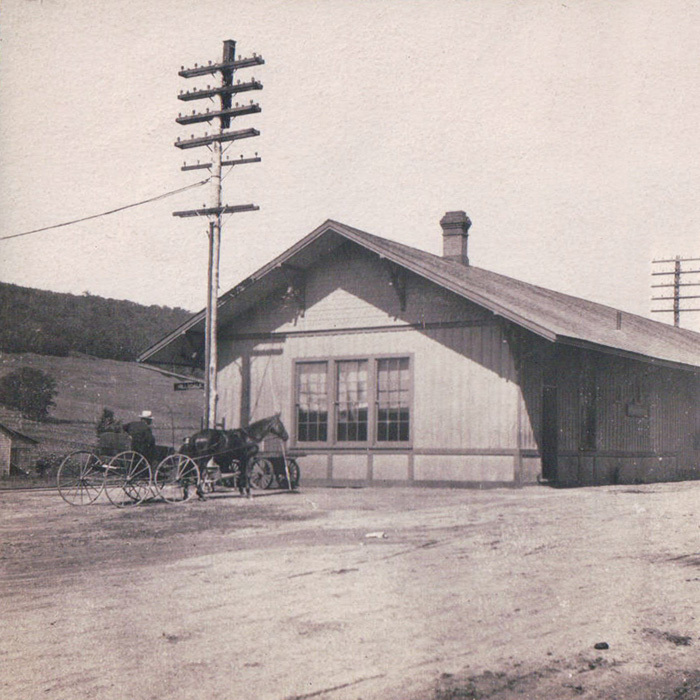 The building itself gives us a point in which to gather our bearings, and highlights the absence of the railroad, and the old rail depot. 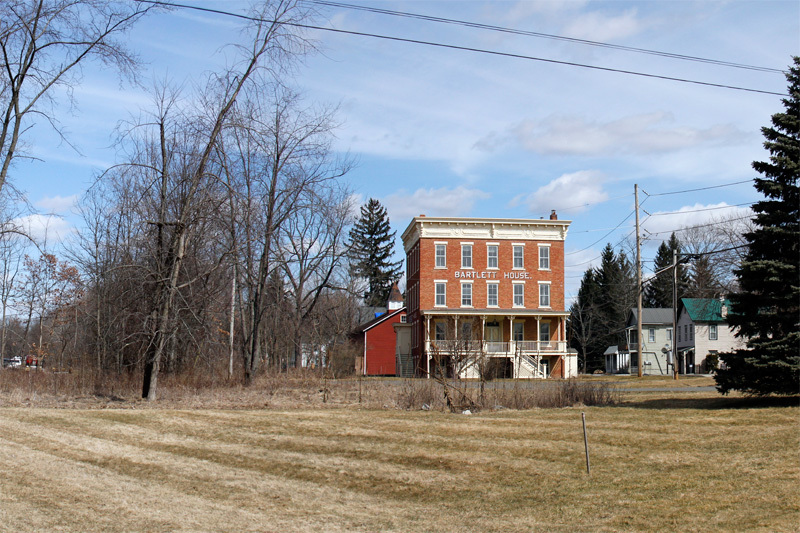 Ghent’s Bartlett House was likewise a railroad hotel, built in the 1870’s, and recently nominated for the National Register of Historic Places. The hotel hosted teachers, traveling salesmen, and plenty of other rail passengers – it was even captured by the lens of famed photographer Walker Evans. 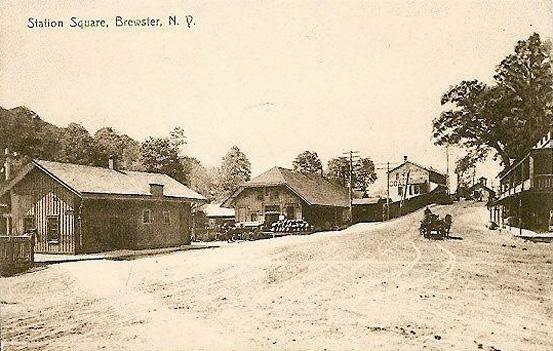 Besides the hotel, the building contained a dining room and a ballroom, occasionally the site for brawling politicians. 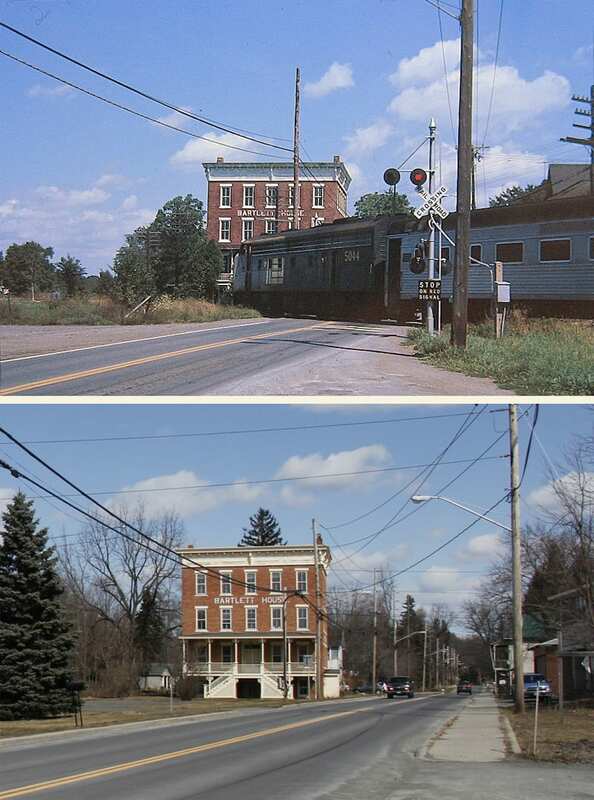 Though part of the building is blocked by the train in our historical photo, the Bartlett House looks very much as it did when first built – in 2011 the front porch was redone based upon historical photos. 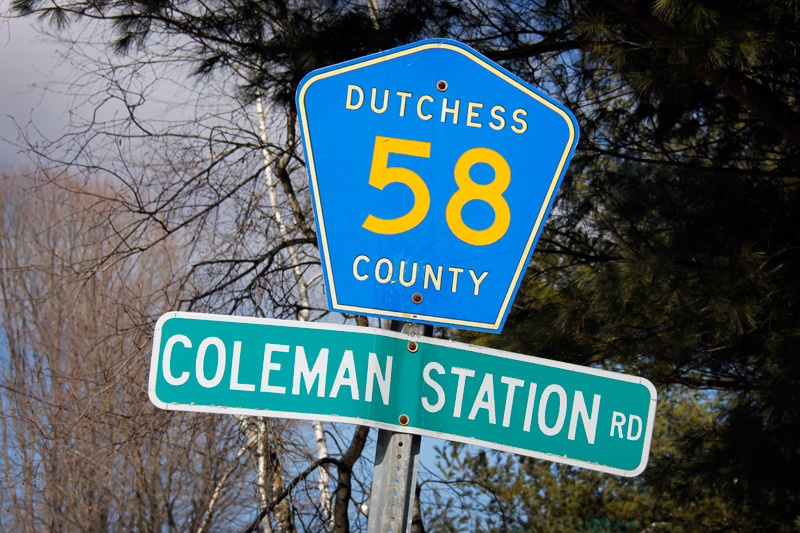 That pretty much wraps up our tour of the Upper Harlem Division’s stations. 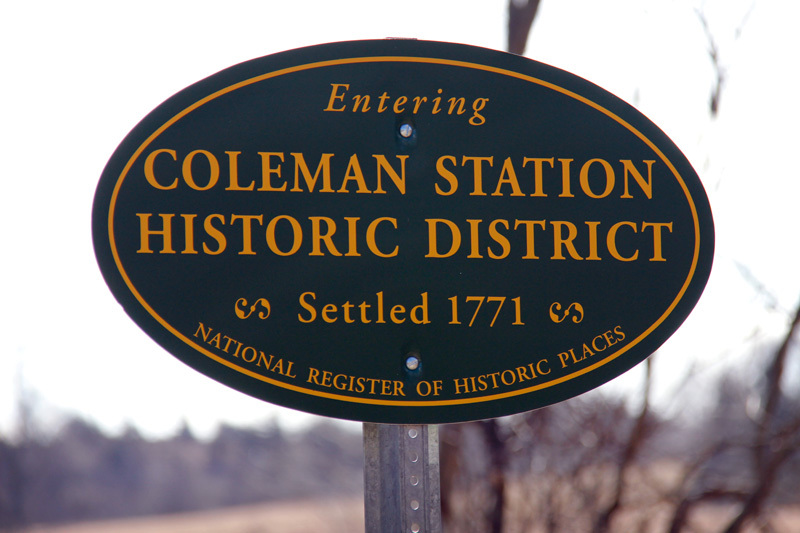 Many of the physical stations may be gone, but there is surprisingly quite a bit that can be found that reminds us that there was a real railroad that once ran through here. 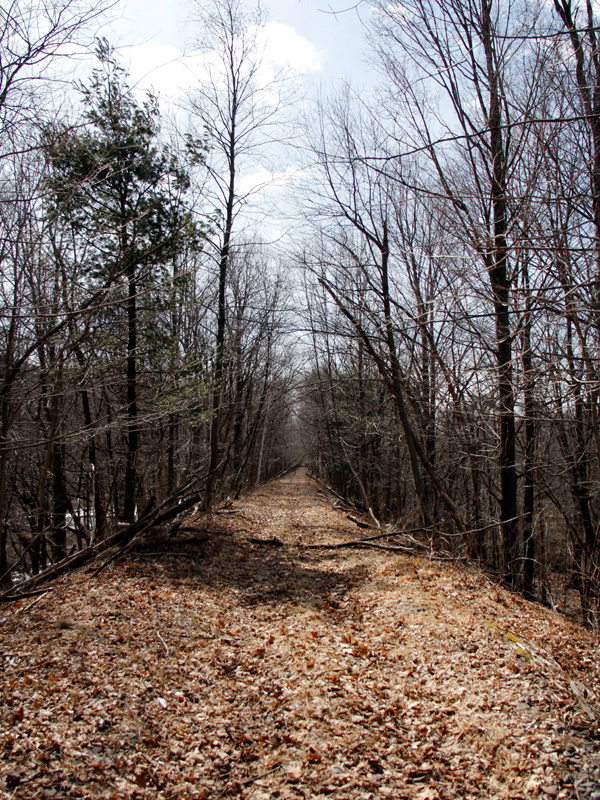 In fact, much of the former route can be seen visually from satellite maps – there is an obvious swath of barren land that marked where the rails once were. That, of course, may one day fade. 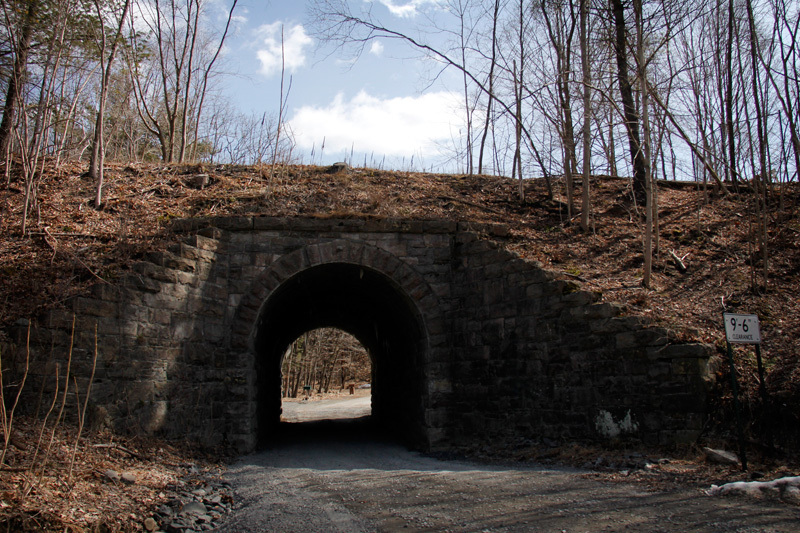 But if the Harlem Valley Rail Trail Association has their way, the entire route of the former Upper Harlem Division will at least be preserved as a trail, which I suppose is better than being forgotten entirely. Just the other day I was chatting with a coworker about riding the train – she lives in Mount Vernon and mentioned occasionally riding the “red line” into the city. I had to chuckle a little bit – it is usually the uninitiated newbies that refer to the Metro-North lines by their colors. The color of each line, however, is deeply ingrained in all of us. 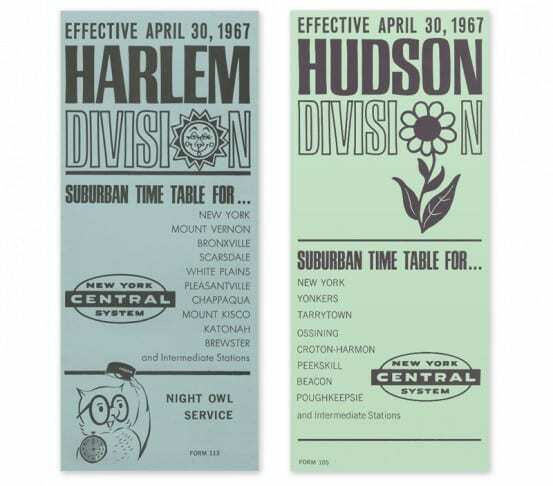 From the signage on the platforms to the printed timetables, we all pretty much know that the Hudson Line is green, the Harlem blue, and the New Haven red. But where did these colors come from, and how long have they represented each line? 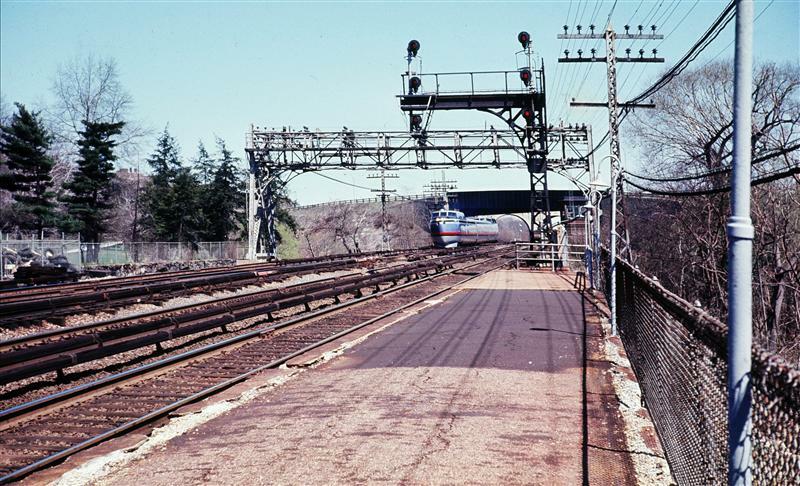 Most obvious is the New Haven Line. 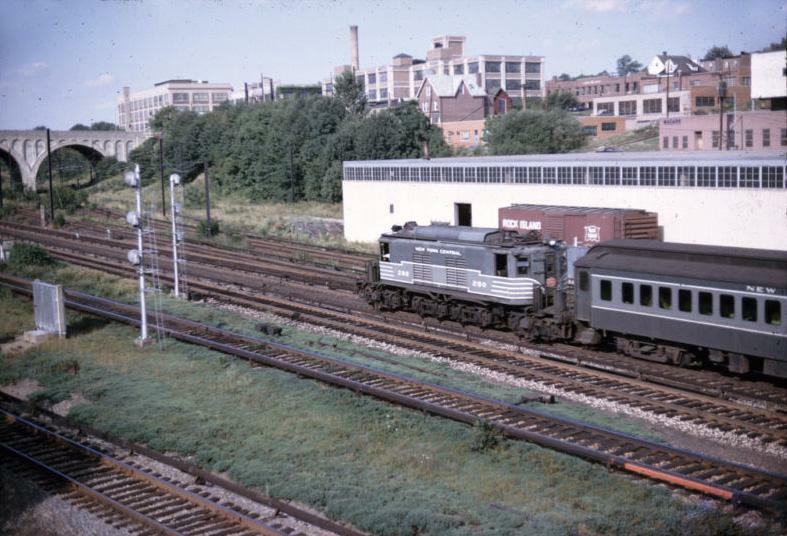 The New York, New Haven & Hartford Railroad, of which today’s New Haven Line was once a part, long used red for printing and locomotive paint schemes. 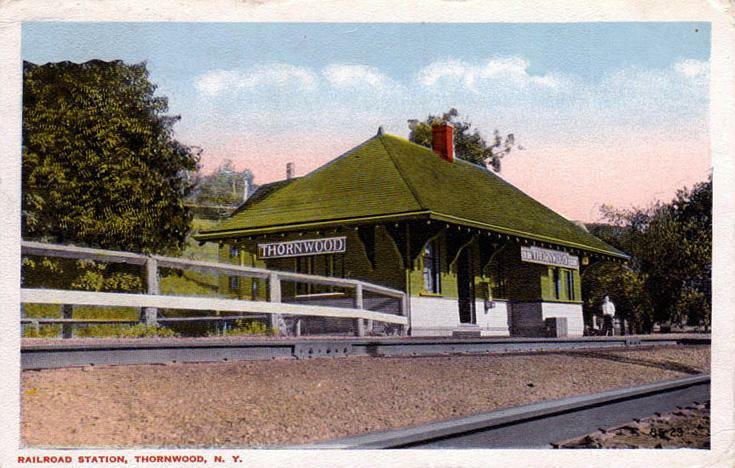 Although not part of the core Metro-North lines on the east of the Hudson River, I’ve always thought that the selection of orange to represent the Port Jervis line was a little bit clever – much of the line runs through Orange County. 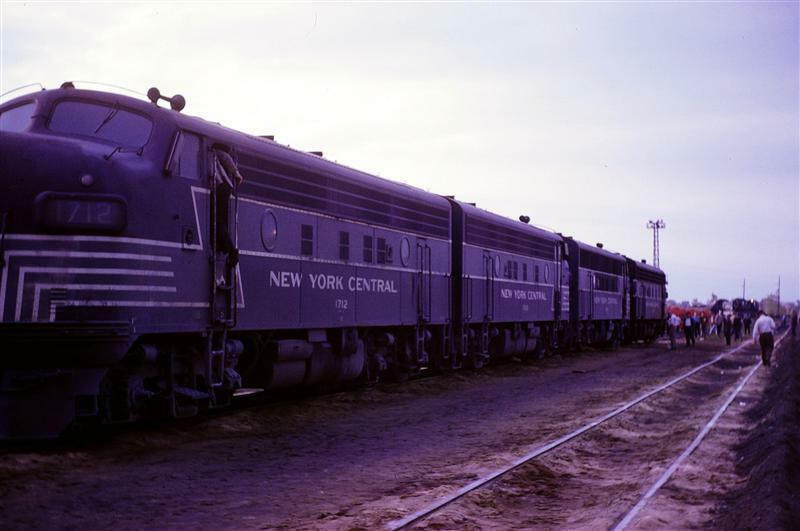 I’m not sure how the Harlem became blue, and the Hudson became green (you’d think it is backwards – blue seems more appropriate for the line that runs along the Hudson River), the two colors have been established long before Metro-North ever came into being. 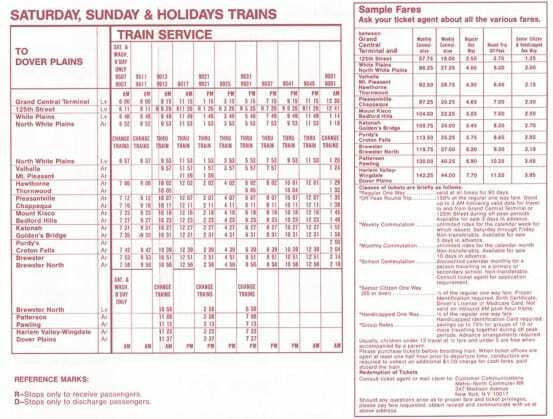 Their first usage on timetables dates back to around 1965. 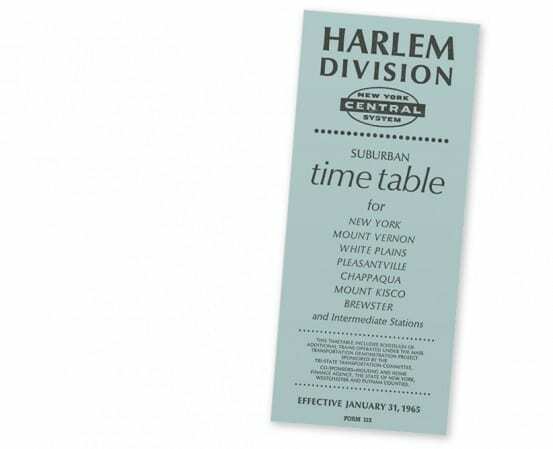 One of the very first (in not the first) New York Central timetables where the Harlem Division is colored blue. 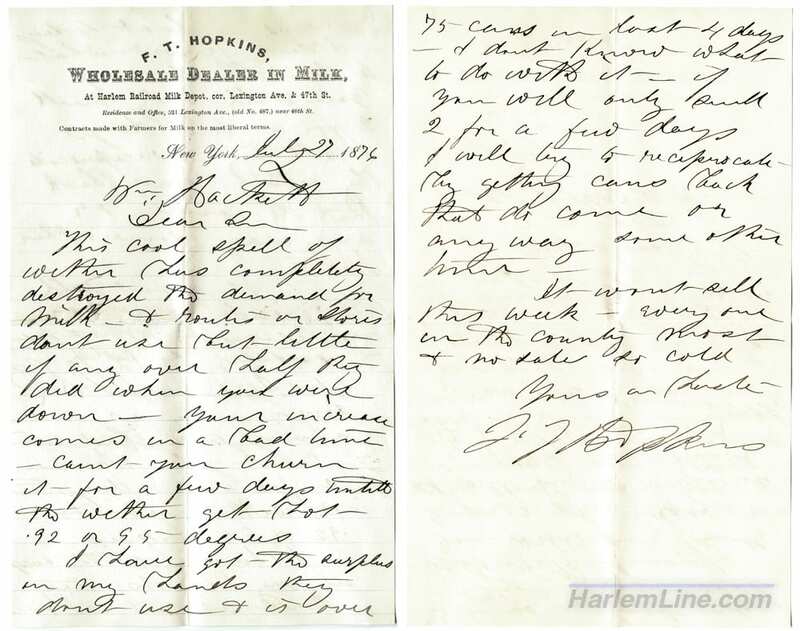 The first uses of the blue and green color for the Harlem and Hudson Divisions was not in the ink – it was the paper. These two are from April 1967. Some of the earliest timetables using blue ink. 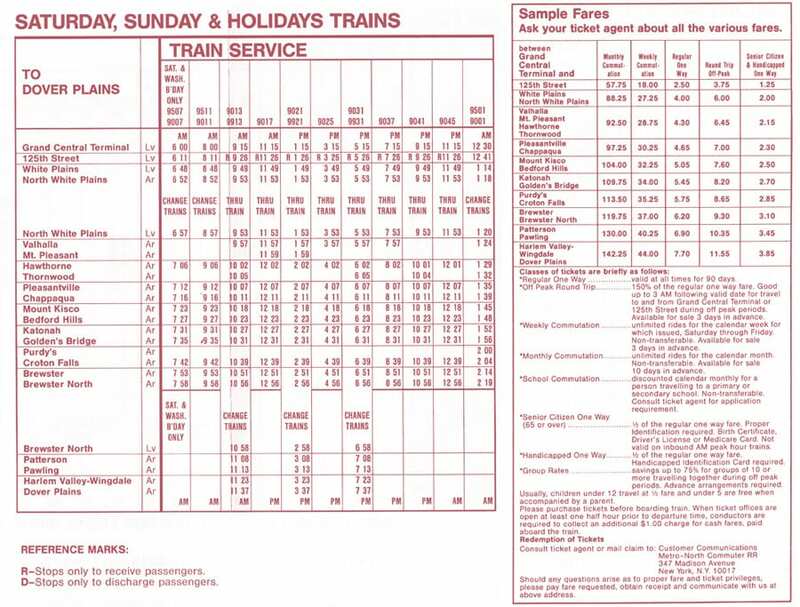 Although there were a few more printings of timetables on blue paper, the blue ink on white paper became the standard, which continues today. Blue ink on white paper eventually became the standard for Harlem timetables, though there were a few times over the years where the rules were totally broken. 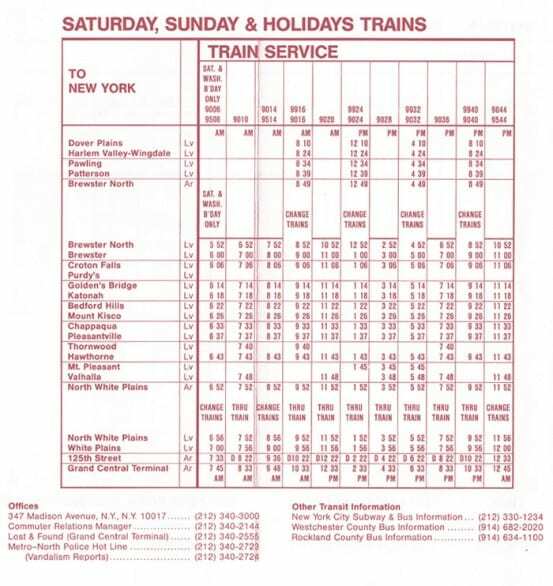 One of the most odd was an early timetable printed by Metro-North in 1983 – in maroon ink. I have no idea why anyone would have thought to print a Harlem Line timetable in maroon – my only assumption is that it was to catch people’s attention as it highlighted the electrification project underway north of White Plains. 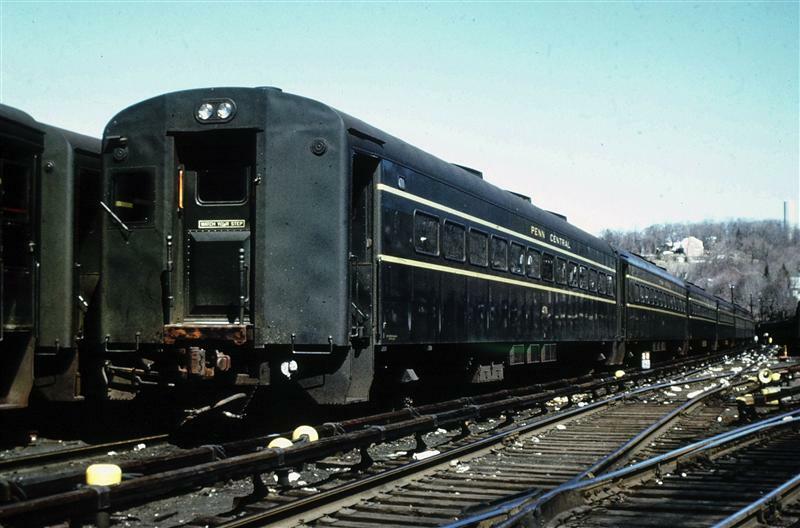 Most amusingly, you’ll note a little mark on the bottom right that reads “Form 112.” Form 112 was the number assigned to Upper Harlem timetables since the New York Central days, which at that time meant service from Pawling to Chatham (or in the early 1900’s, North Adams, Massachusetts). 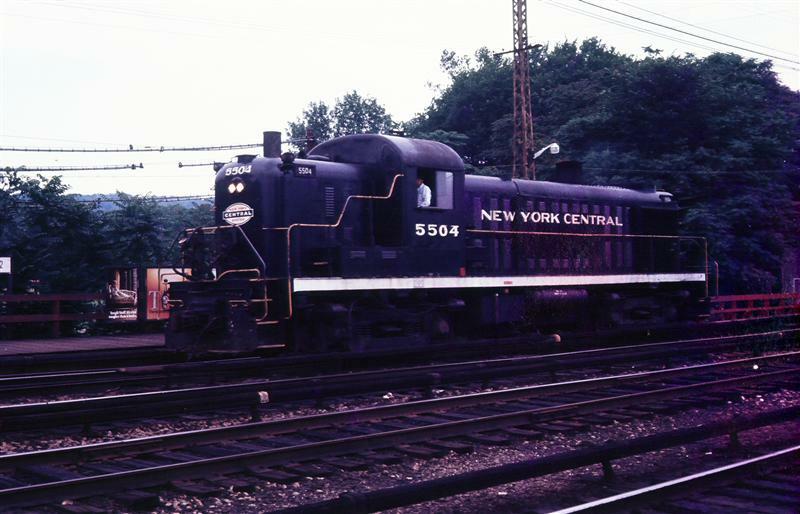 It is a little bit odd to see that form number used for service north of White Plains. 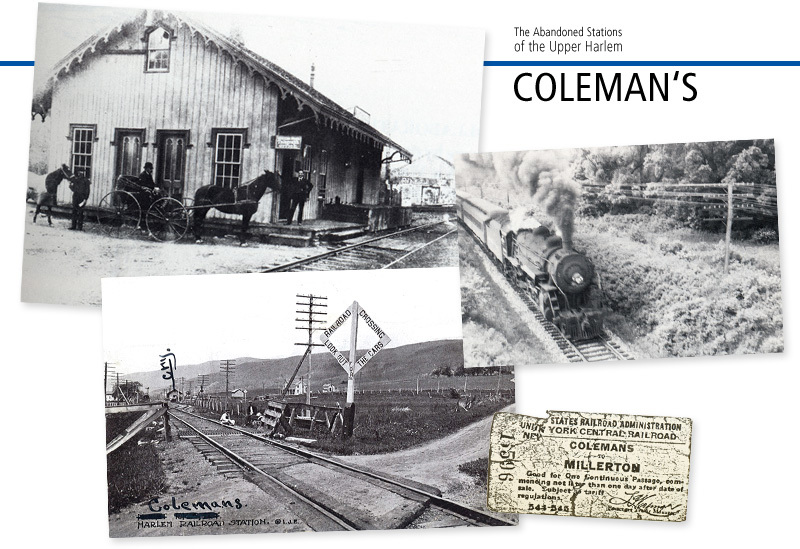 Calling stations like Valhalla, or Mount Kisco the Upper Harlem seems like blasphemy to me. 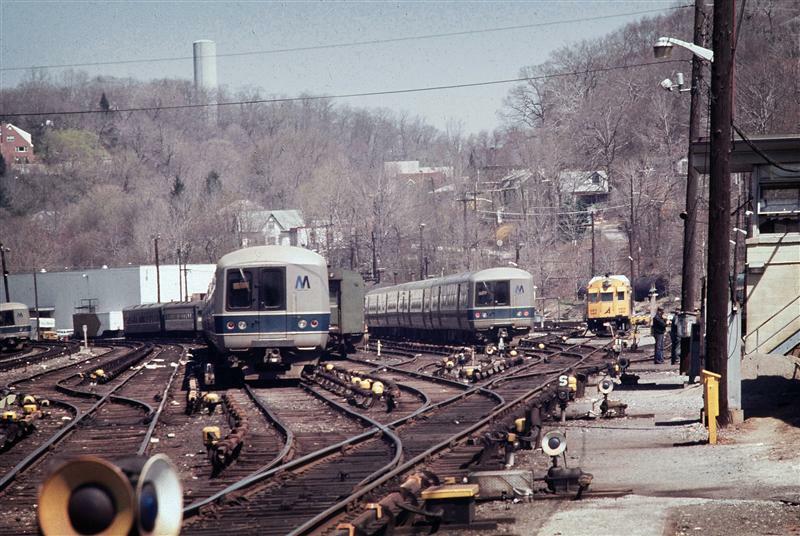 Today you won’t find form numbers on any of Metro-North’s timetables. Their inclusion in the early timetables almost seems like an in-joke amongst the old railroaders working for this new company. 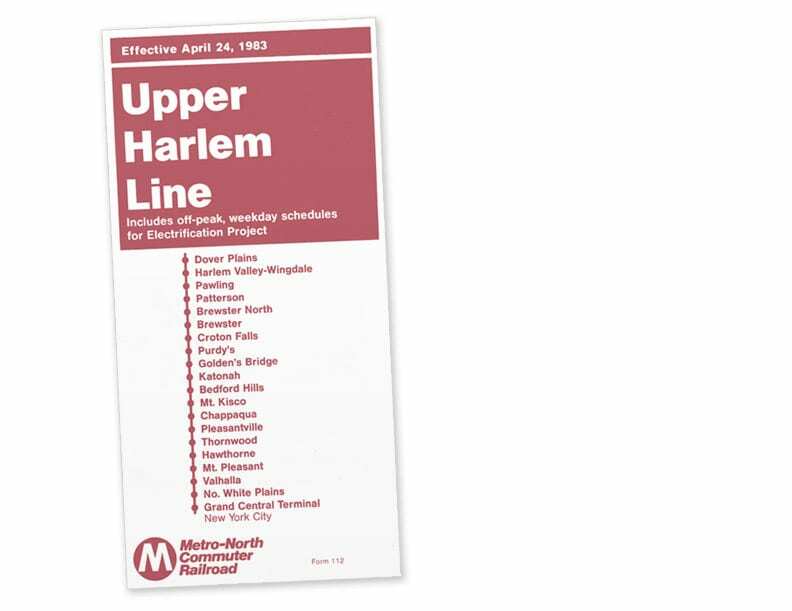 You won’t see “Upper Harlem” timetables either – the entire line is usually printed in a single timetable, making this particular timetable rare. Below is the rest of the timetable, which is a bit interesting to see… especially the listing of the fares when Metro-North took over from Conrail in 1983. Good morning, everyone. 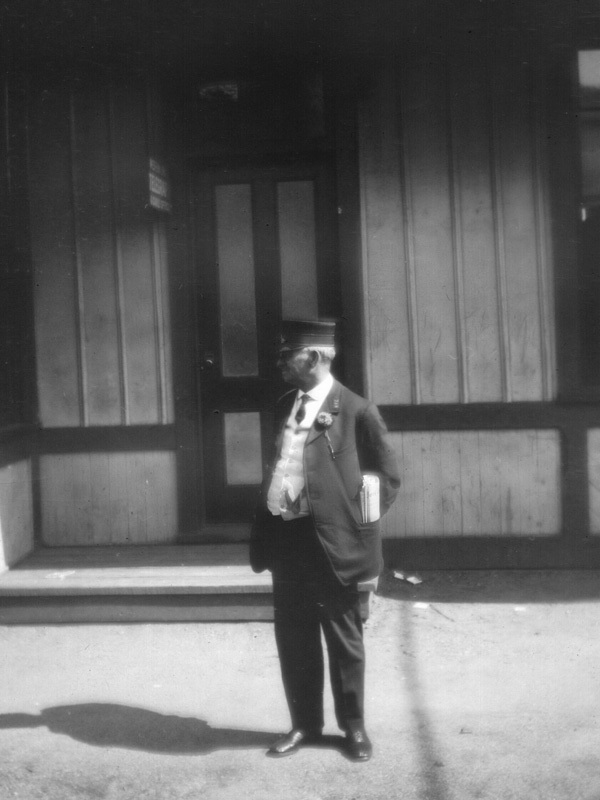 I hope you are all enjoying your long weekend for President’s Day… that is, unless you are a conductor, or me, or one of the other unfortunate saps that find themselves working on this day. Last Friday I posted a whole bunch of my recently acquired postcards from my number one most visited website – eBay. But postcards and timetables are not the only thing I buy on there. 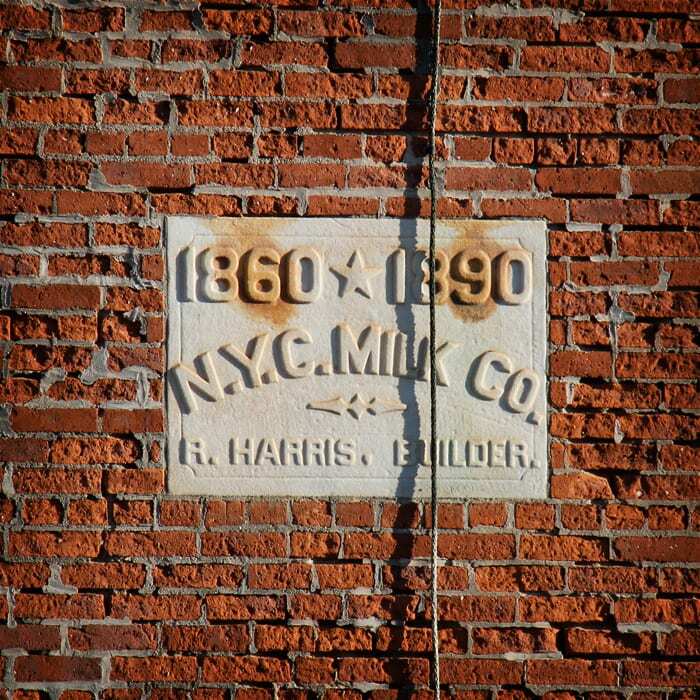 If there is a nice slide of something happening on the Harlem, I usually can’t resist. Today I’m posting a small selection of my most recently acquired photos. 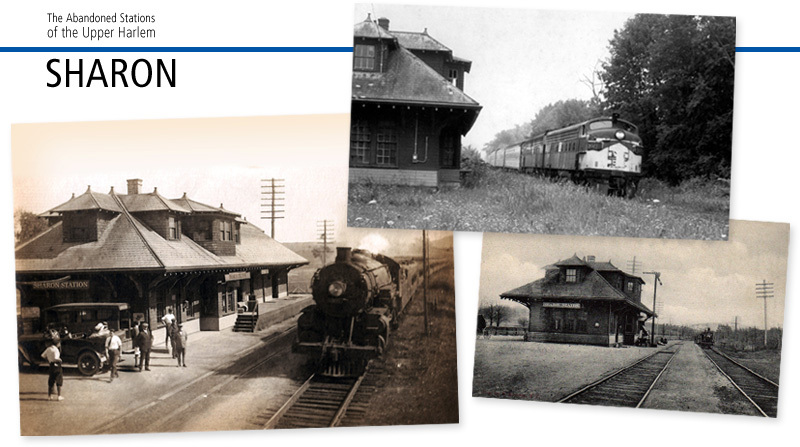 There are plenty of old trains, low-level platforms, and even a station or two that are no longer in service. Enjoy! 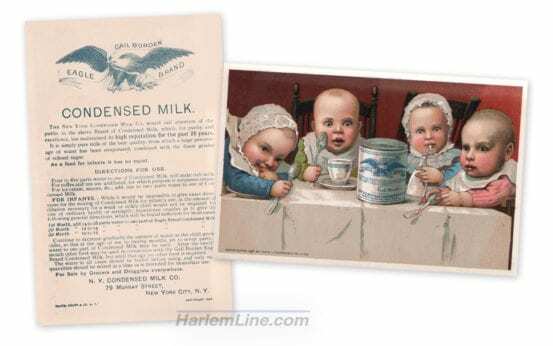 Imagine that we are in the year 1920. 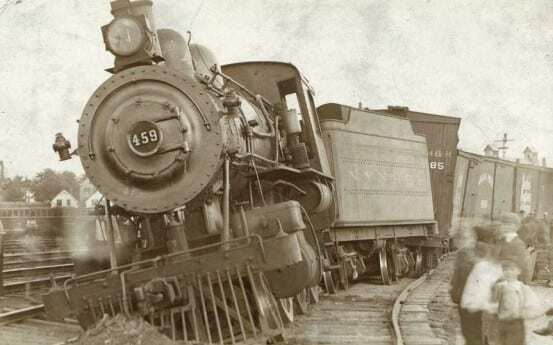 A train has just had an accident. As people rush over to attempt to assist, so too does a photographer. 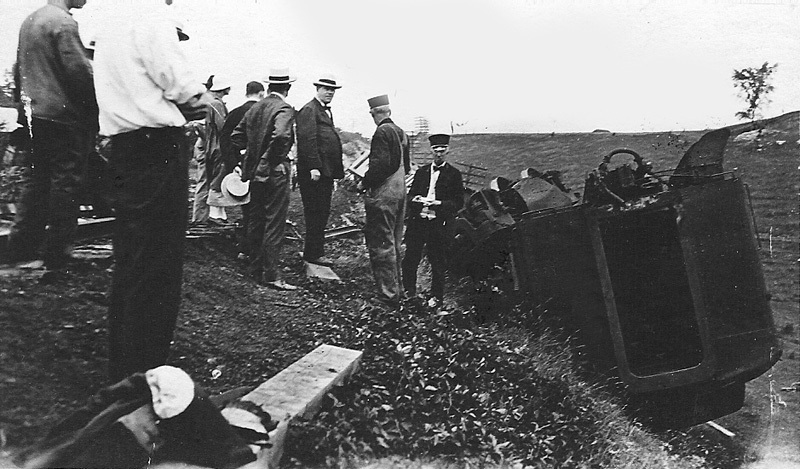 Camera in hand, the photographer takes a couple snaps of the wreck. Not only for event detailing purposes, but for postcards too. 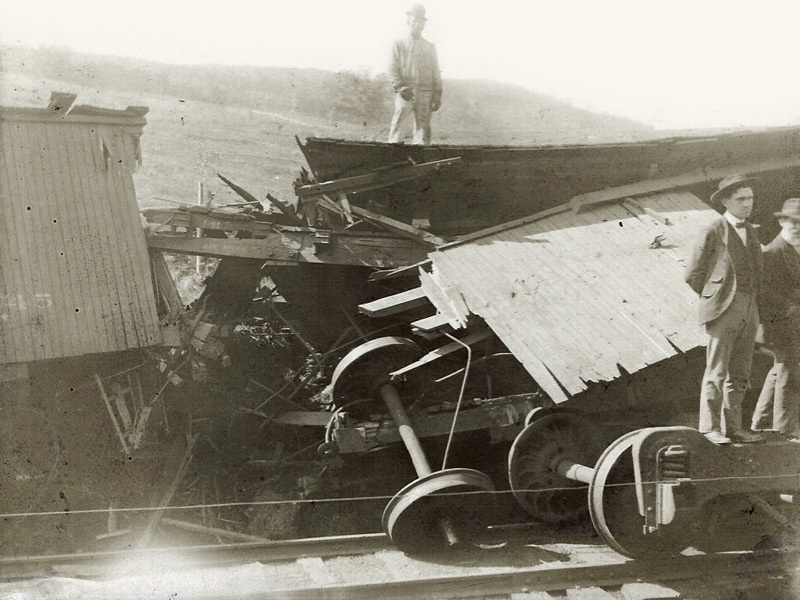 I’ve become a crazy postcard-collecting nutjob, and every time I see a train crash postcard, it makes me chuckle a little. 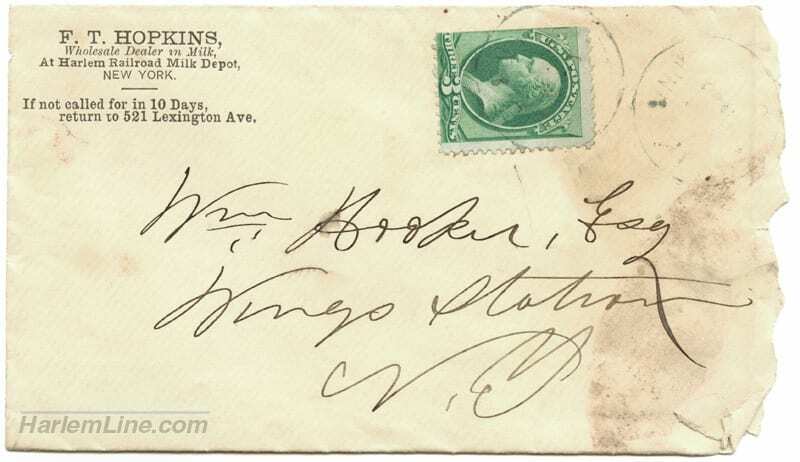 Postcards were printed with pretty much anything and everything on them… but I suppose it makes sense, they provided an easy way to share (back before we had this thing called internet, boggles the mind!) 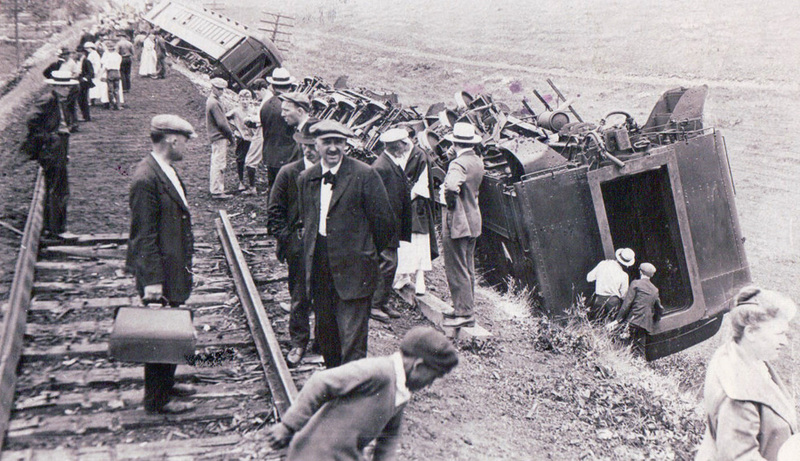 Of course, it is just human nature to want to see a train crash, or any crash, period. Any person that has ever been in a car moving past an accident knows exactly what I’m talking about. 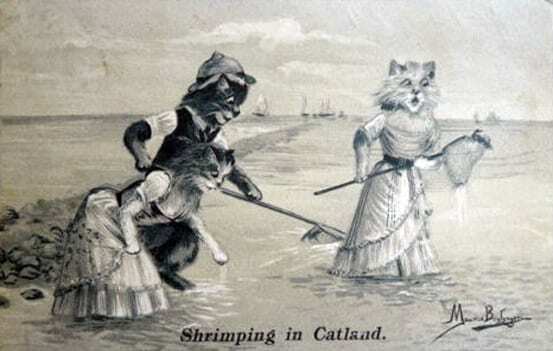 And if I wanted to send you a LOLCat back in the day, I’d send you this. 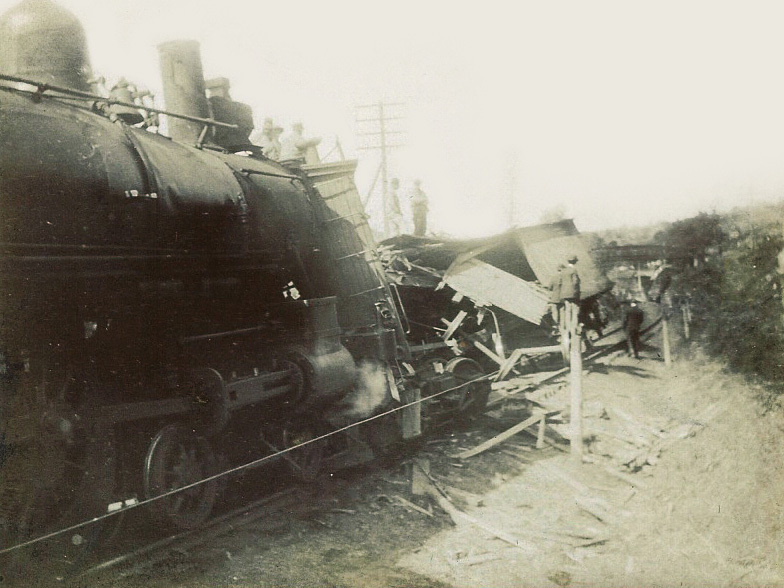 Unfortunately, I’ve yet to discover a Harlem Division train crash postcard. I have found quite a few station images, many of which I’ve posted previously. 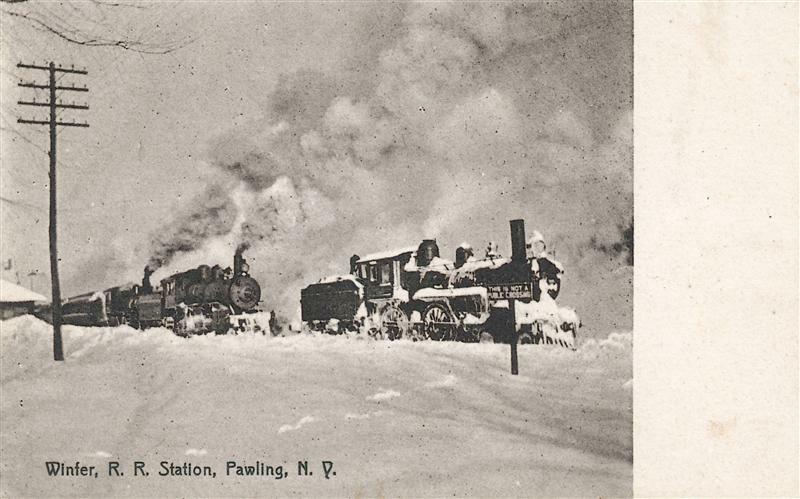 Today I have a few more of those for you, as well as some more “everyday” scenes: track workers at Dover Plains, a locomotive crossing a road in the snow, and horse carts delivering milk to the train station to be transported to the city. 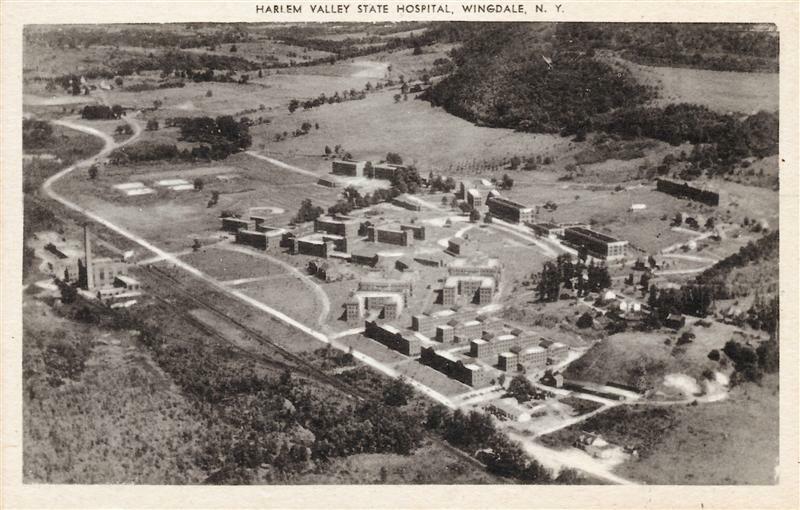 Thrown in the mix is a card of the Harlem Valley State Hospital, with the location of the current Harlem Valley-Wingdale station visible. Make sure you enjoy this somewhat chilly Friday (where’s my hat?! ), and don’t get too frustrated if you see anybody rubbernecking on your way home this evening! Just think, hey, that could be on a postcard!